Mandalas are considered sacred symbols in numerous spiritual and ritual practices. Depicted as a representation of the universe, mandalas are commonly used in various religions and philosophies, especially Buddhism. They originate from ancient India, where they have been used in meditation and healing practices for centuries. 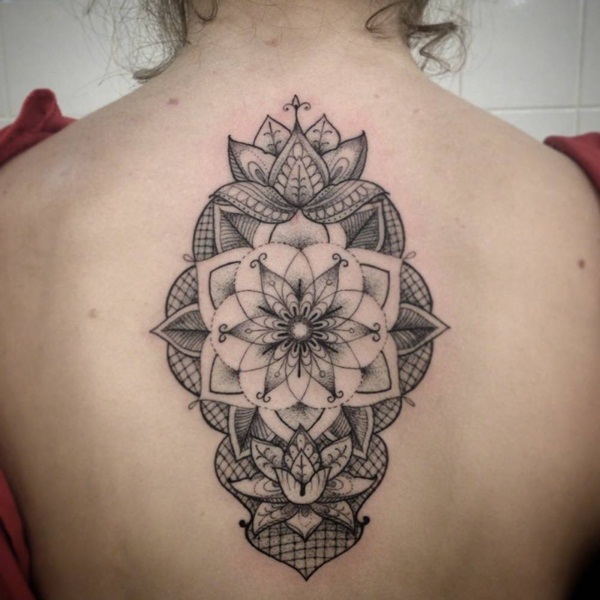 A mandala is one of the most popular themes when it comes to tattoo designs. The deep meaning and aesthetic beauty of this symbol make it a favorite among tattoo artists. 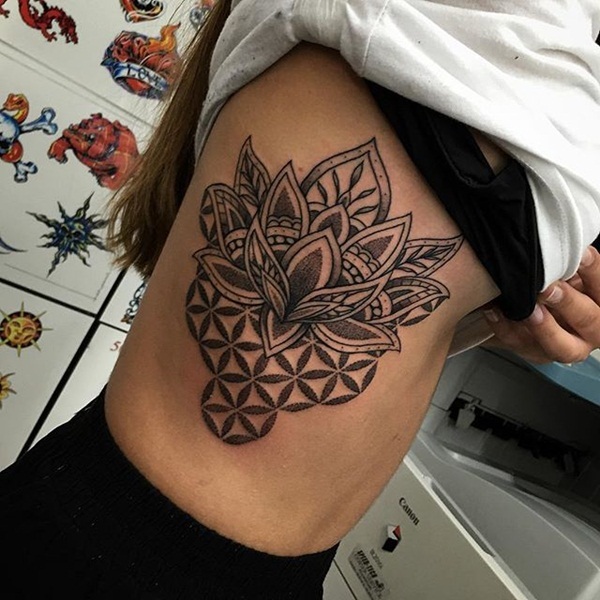 Many artists combine lotus blossoms with mandala tattoos to add meaning and infuse floral beauty into the tattoo designs. In Buddhism, the lotus flower symbolizes the act of overcoming materialistic worldly desires and transcending into a state of enlightenment, which involves spiritually uniting with the universe. Gautama Buddha used the lotus to depict how worldly dirt doesn’t stain the soul, just like how mud doesn’t soil the lotus as the flower grows. In essence, lotus is a symbol of purity. Different colors of the flower also convey varying meanings. The red lotus, which bears a similarity to the heart, depicts love and burning passion. A purple lotus somewhat symbolizes mysticism. The eight petals of a lotus are seen as the representation of the eight-fold path advocated by Buddhism. 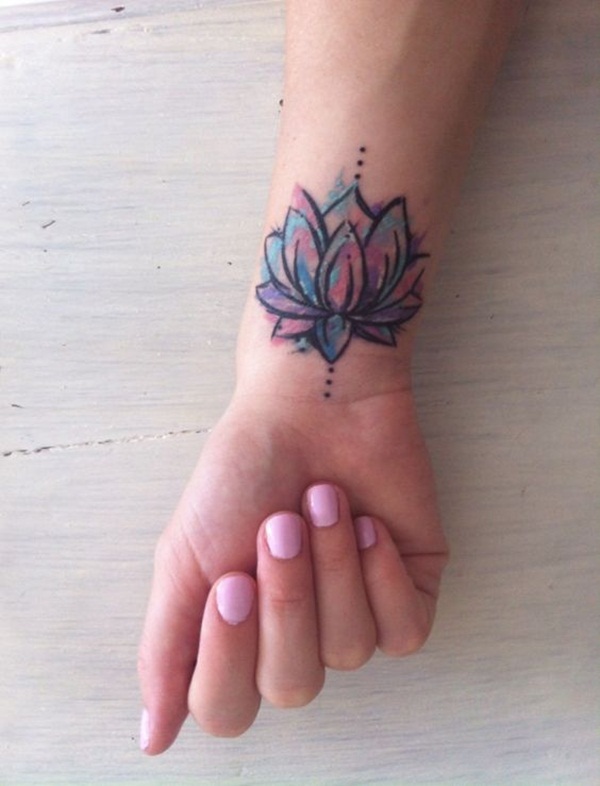 Another type of colored lotus is a pink lotus, which embodies divine devotion. A blue lotus, on the other hand, exemplifies intelligence and lifelong learning. A white lotus stands for peace as well as purity spiritually and mentally. According to the Buddhist religion, Buddha arose from a lotus flower, and his heart was white meaning his soul was pure and holy. Buddhists see the shedding of the flowers and seeds of a lotus as a sign of a virtuous soul guiding other souls toward Nirvana. In Hinduism, the lotus is a pristine flower that portrays purity. It is also related to wealth and creativity deities. Additionally, the lotus symbolizes chakras or the energy centers believed to affect a person’s physical and spiritual health. Meditation practitioners stare at lotus designs for a long time to achieve enlightenment. The highest spiritual form of lotus mandala designs contain 1,000 petals. However, these are quite complex, which is why many artworks generally feature smaller numbers of petals. 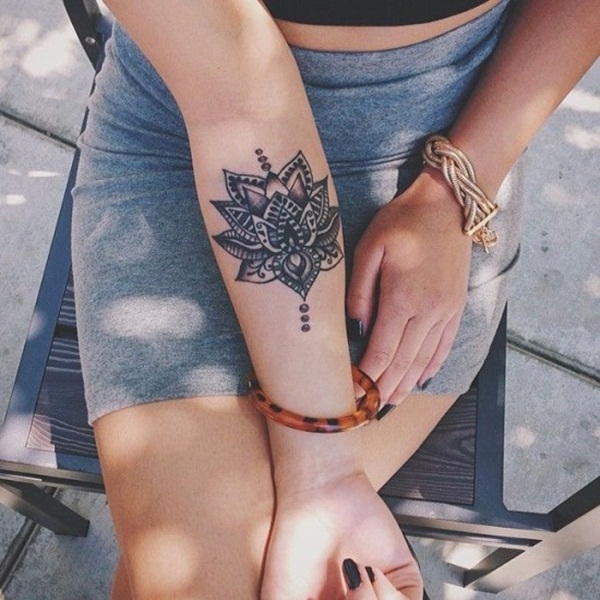 Some mandala tattoos have eight or nine petals as these numbers are thought to hold a sacred meaning. In Chinese culture, the lotus depicts flawless beauty. Poets, writers, and artists use this flower as a subject of their work because of its enchanting beauty. 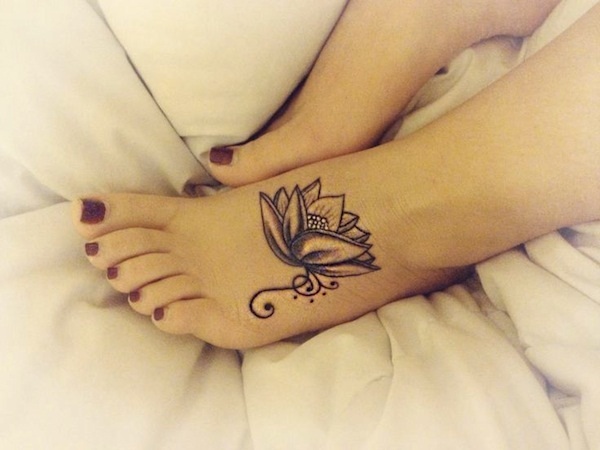 When it comes to relationships, lotus symbolizes perfect harmony. In Egypt, the flower signifies reincarnation and the start of a new life. The lotus was believed to bloom from the sea, bringing life and leading to the creation of mankind on earth. In the West, the lovely flower also denotes the same meaning of life and rebirth. 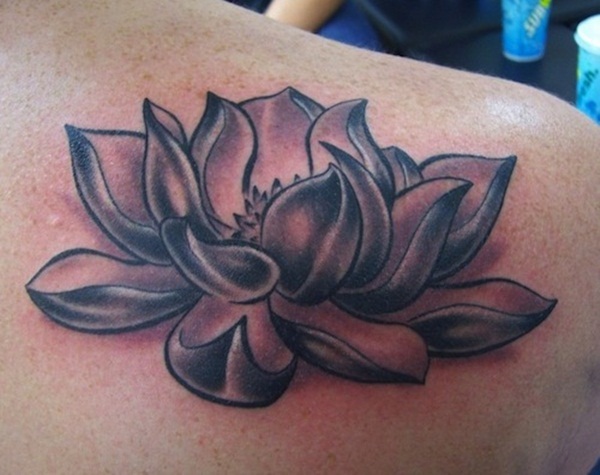 Additionally, the lotus is used to depict the search for meaning in a person’s life. 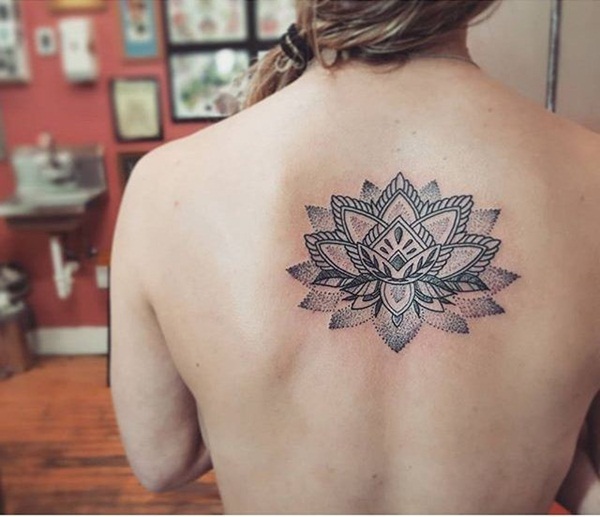 Now that you know a little bit of history about the mandala and lotus symbols, take a look at this vast collection of the most creative and meaningful lotus mandala tattoos. 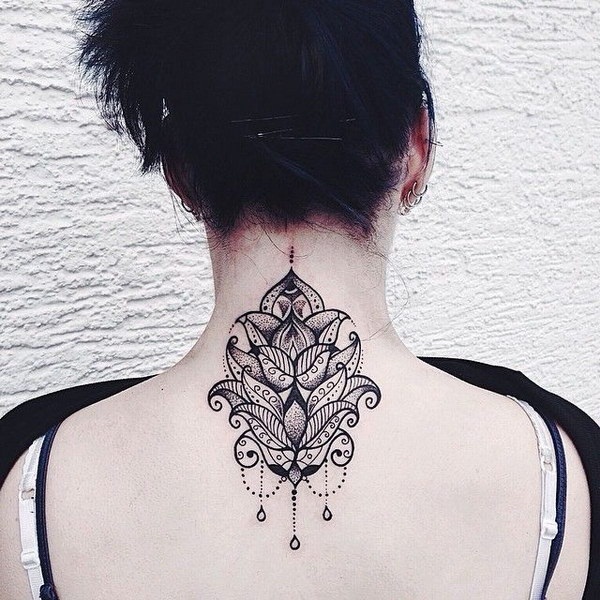 Get inspiration for your next tattoo, or simply revel in the beauty of these stunning designs. 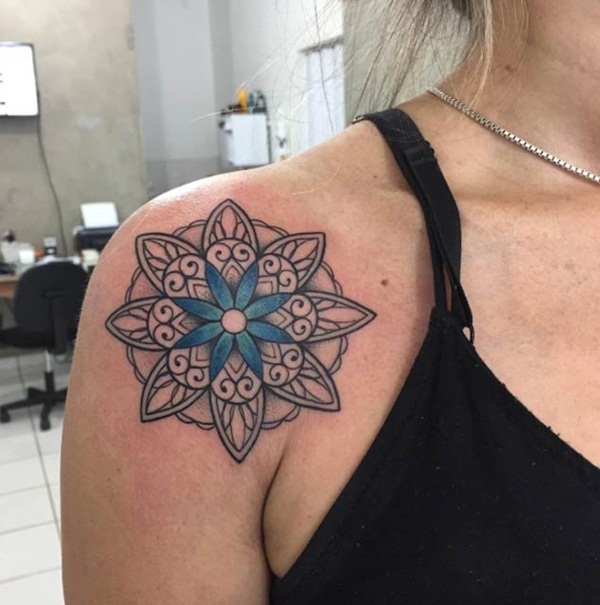 This shoulder mandala tattoo predominantly uses varying shades of blue, emanating a sense of tranquility as blue is a color that represents peace and calmness. 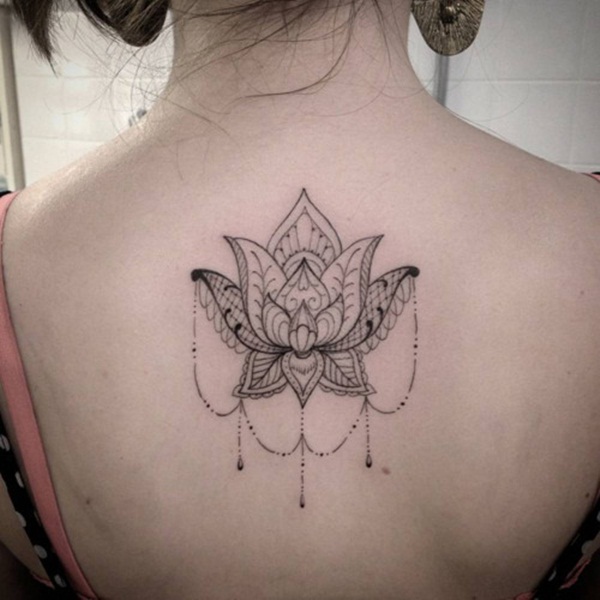 The tattoo uses eight petals in the outermost line as well as in the inner flowers. 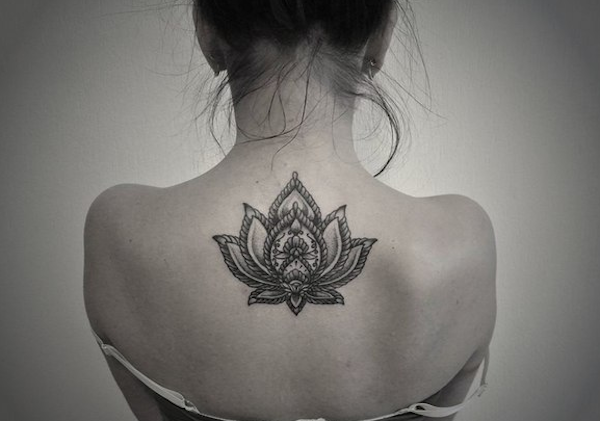 A lotus mandala tattoo is a perfect choice for women, as it symbolizes life, beauty, and spirituality. There’s something beautiful about the way a lotus emerges from murky waters and shows off its lovely bloom. 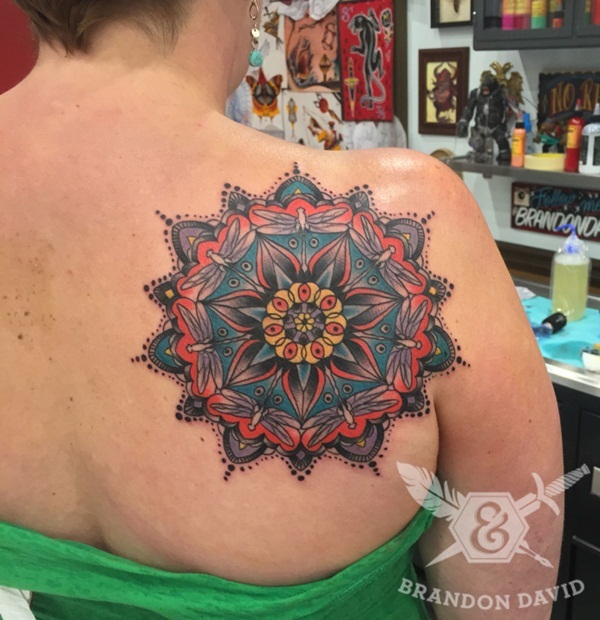 Pink, blue, and purple watercolor shades in the backdrop bring out the beauty of this mandala tattoo, while dangling accessories add style and appeal to the design. 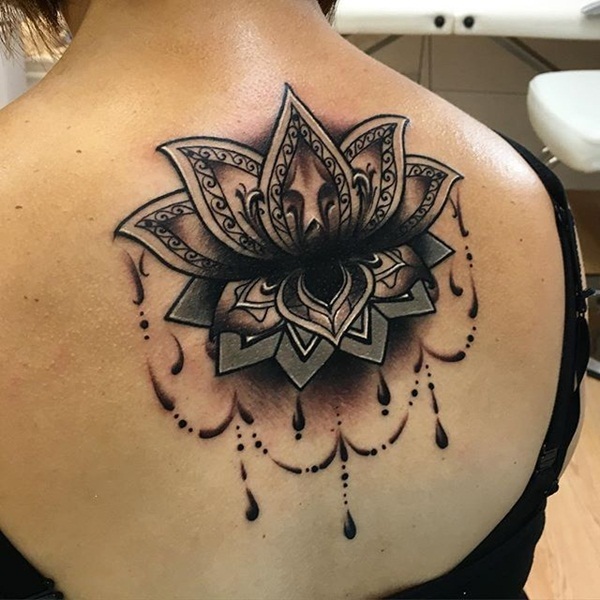 This chest tattoo features a design that appears to have a reflection of itself, as if a lotus springing from the waters. 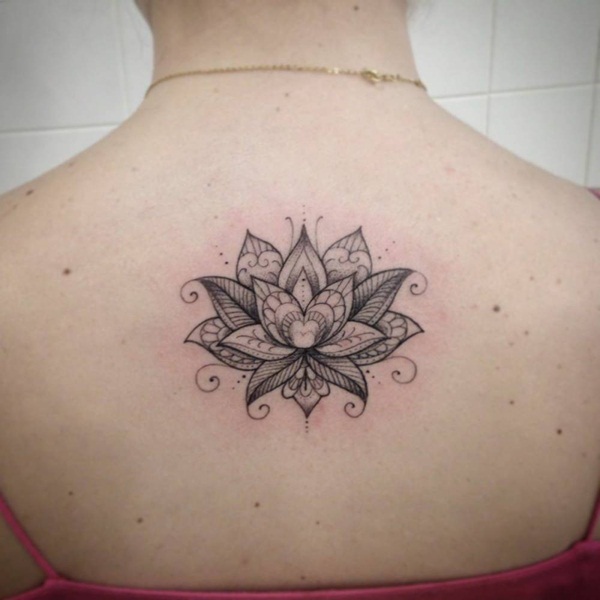 A simple depiction of the blossoming lotus, this mandala tattoo is an excellent choice for areas such as the back. 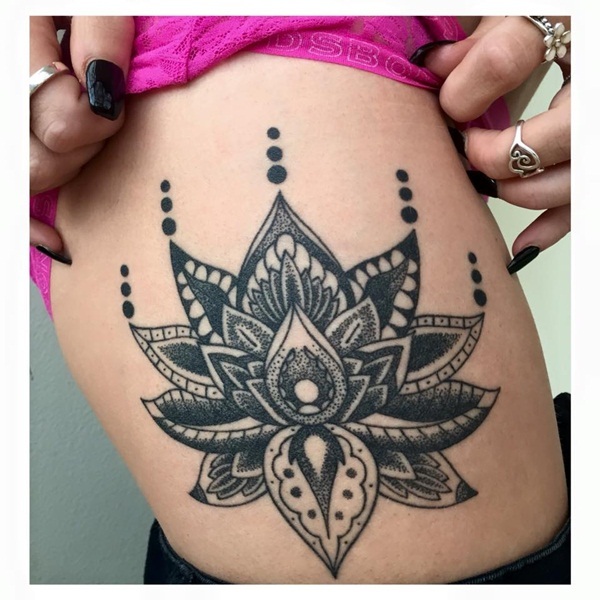 Three dots on the upper and lower sides of this lotus mandala tattoo add a certain symbolic meaning. The watercolor style makes this wrist tattoo colorful and attractive. 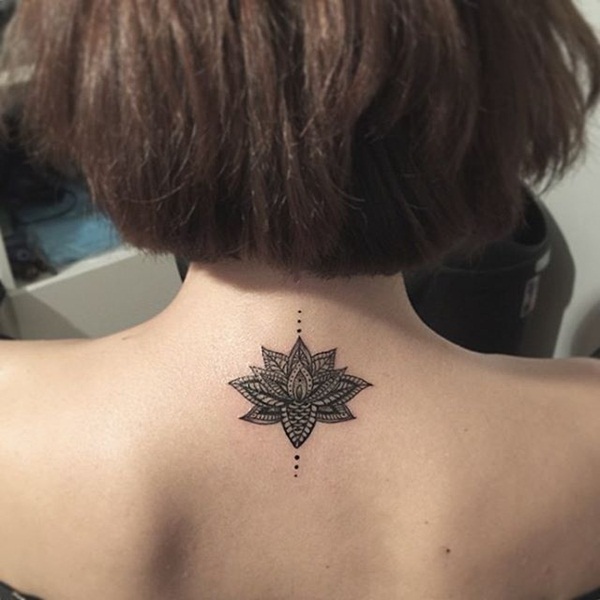 Characterized by thick lines, rich black shading, and inner dotwork, this tattoo immediately captivates attention, especially for women who like to tie their hair and showcase their nape and upper back. 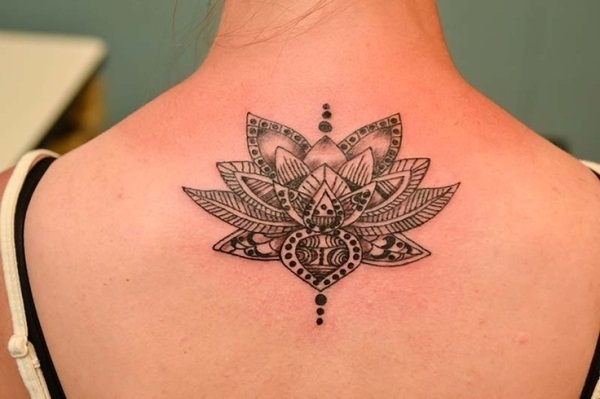 This lotus mandala tattoo has a higher number of petals than typical mandalas, giving it a more complex appearance. 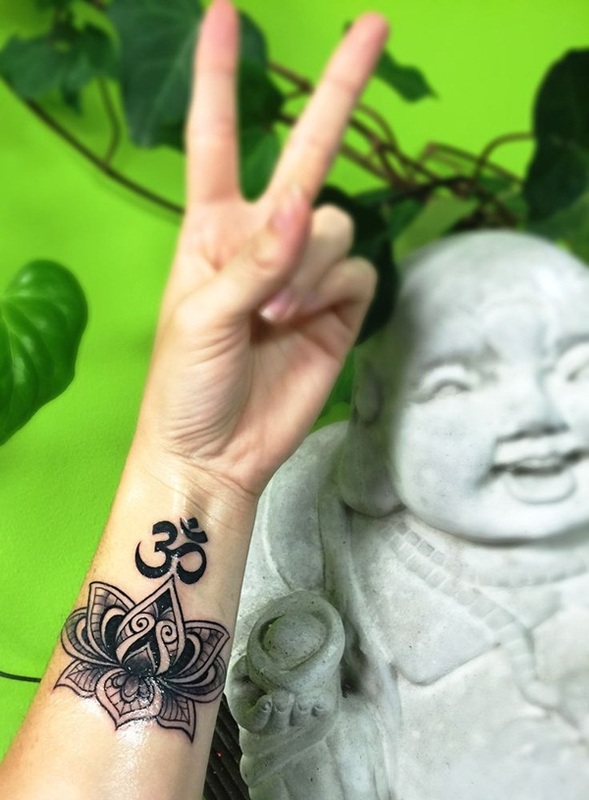 This person shows off a nice black and gray lotus mandala tattoo while making a peace sign in front of a Buddha statue. A symbol lies directly above the wrist tattoo. This image on the whole is brimming with spirituality. 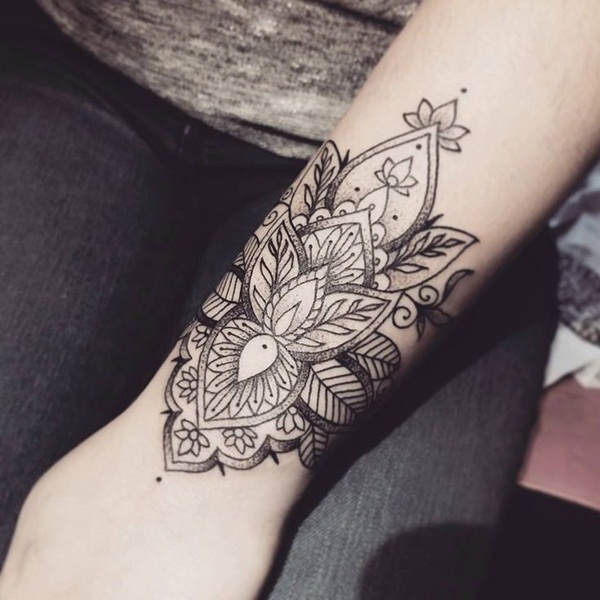 This unique wrist tattoo features only a half portion of a lotus mandala tattoo. 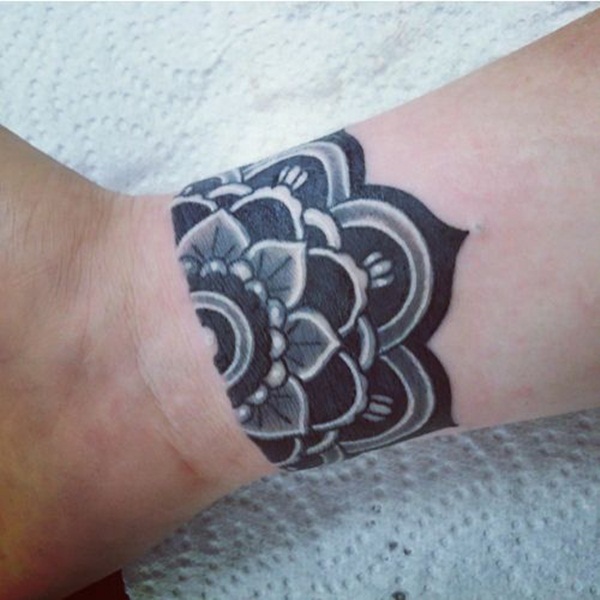 This would make a perfect arm sleeve if the person chooses to add more tattoos to the arm up until the shoulder. 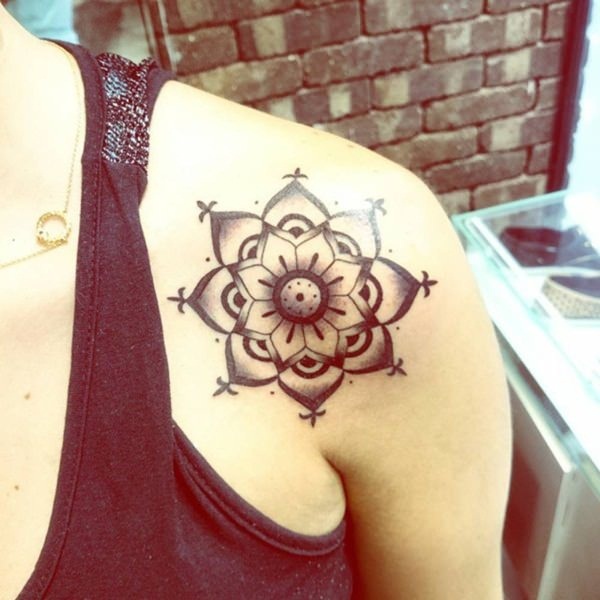 The inner lines of this mandala tattoo are not perfectly straight or curvy, and the light and dark shading creates a unique silhouette. 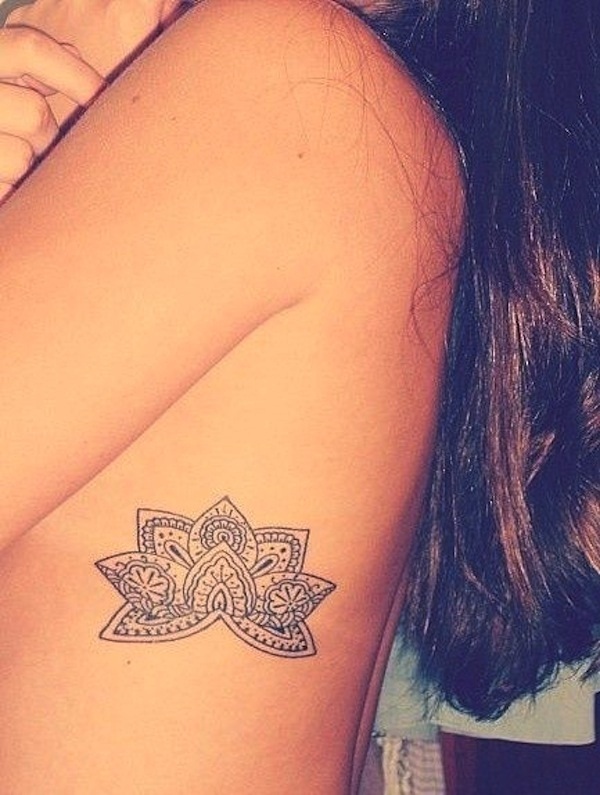 A classic example of a lotus mandala tattoo that looks good on almost any body part. For women, a thigh tattoo looks seductive and adds a certain appeal. 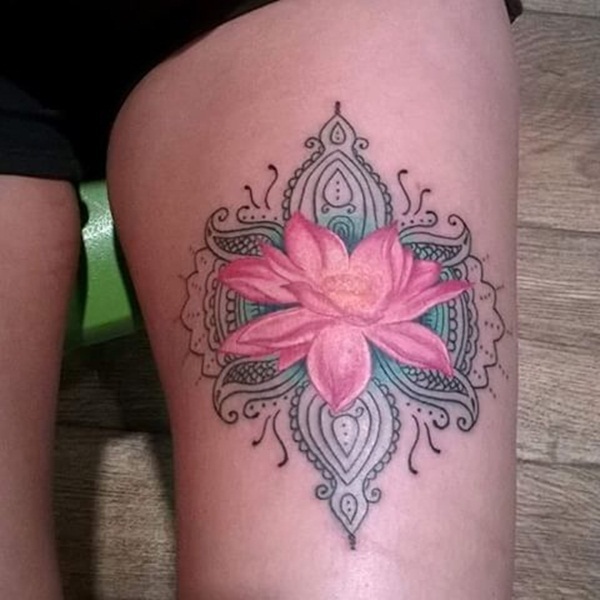 This lotus mandala tattoo showcases a lovely pink bloom that stands out against the green backdrop shading. Dotwork tattooing often takes more time than standard tattoos, as artists have to form shapes and figures by plotting together countless dots. 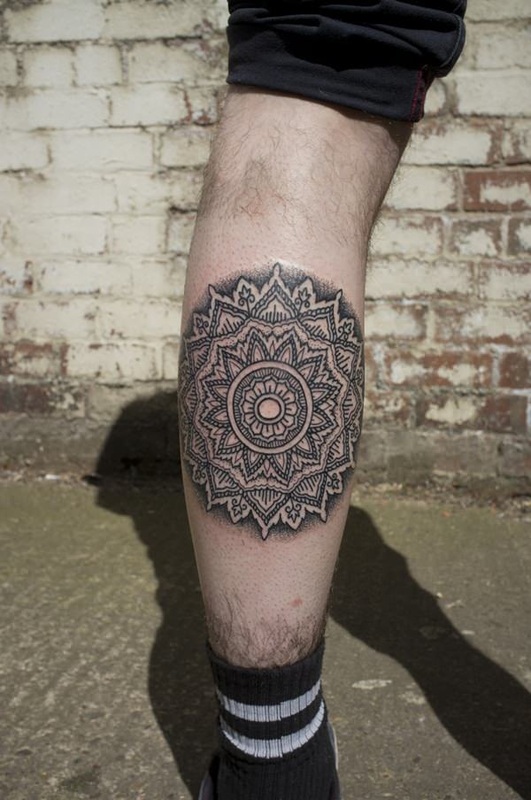 This dotwork mandala tattoo looks impressive and meticulously crafted. 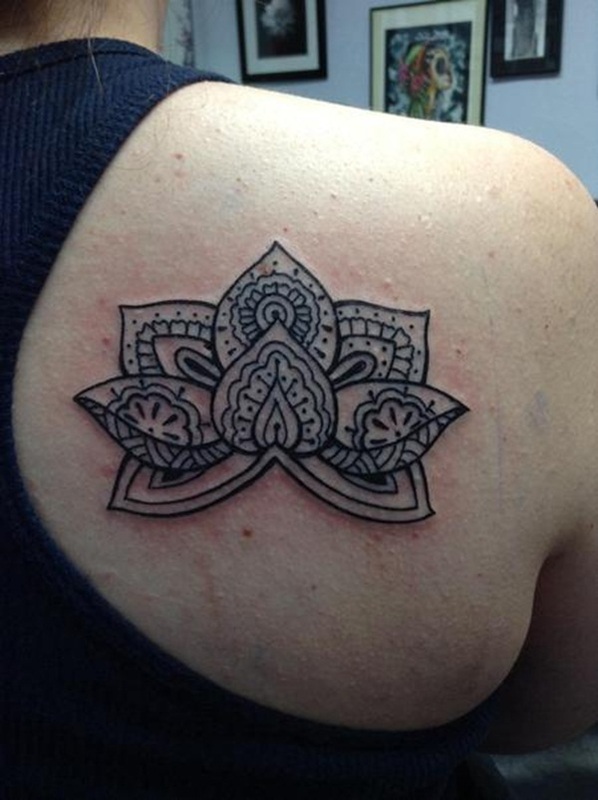 This lotus mandala tattoo doesn’t have a definitive closed outline, giving off a more airy feeling. The shapes of the petals perfectly adorn a shoulder. 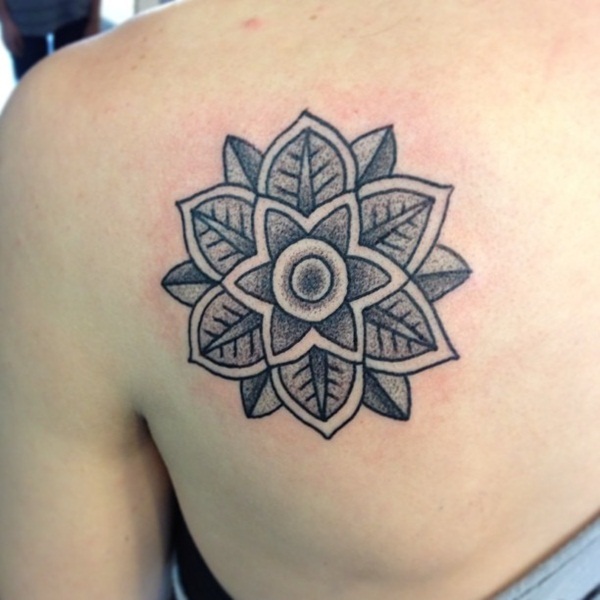 Another lotus mandala tattoo that boasts a nice dotwork style. Extending from the arm down to the hand, this tattoo shows off a more complex design and fine details that onlookers would certainly appreciate. 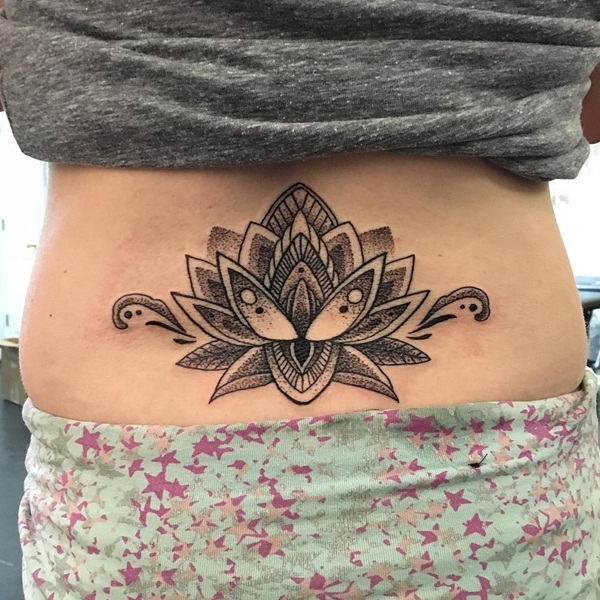 This ornate lotus mandala tattoo features curvy lines and stunning details that make it look like a fluttering butterfly. 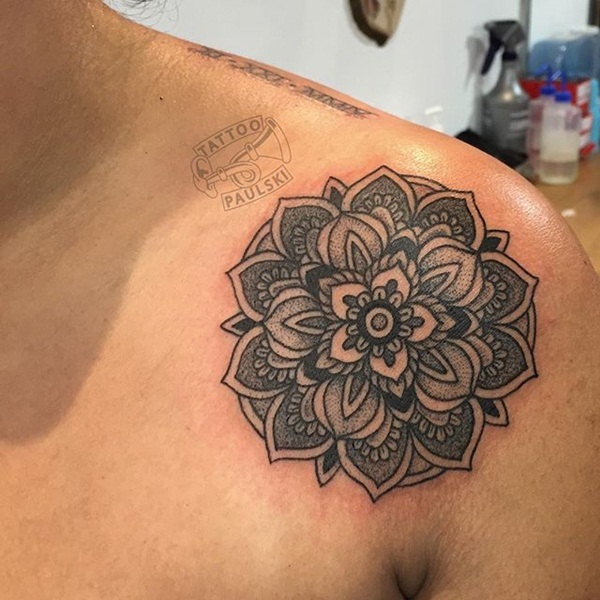 A lotus mandala never fails to be a popular choice when covering a small area like the wrist or embellishing larger parts like the sides or flank area, chest, stomach, and thighs. This back tattoo has round diamond hanging accents that make it look more attractive. 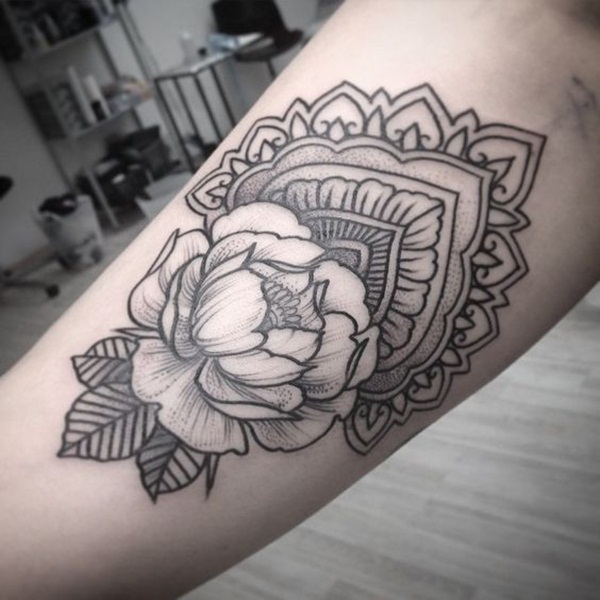 Numerous petals surround this lotus mandala, which boasts an intricate dotwork tattoo technique. 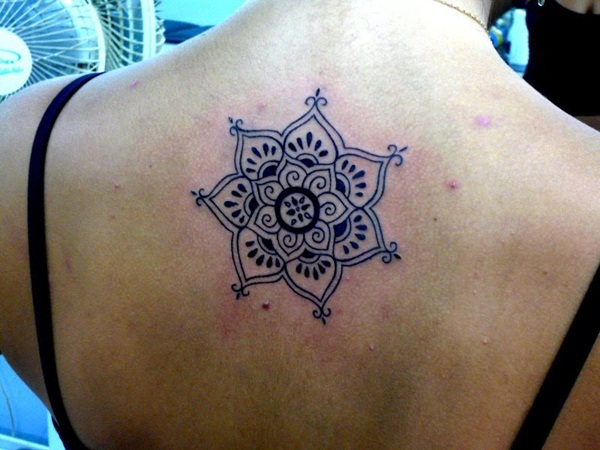 Mandala tattoos are known for their symmetric shapes and patterns. Simplicity defines this cute back tattoo. 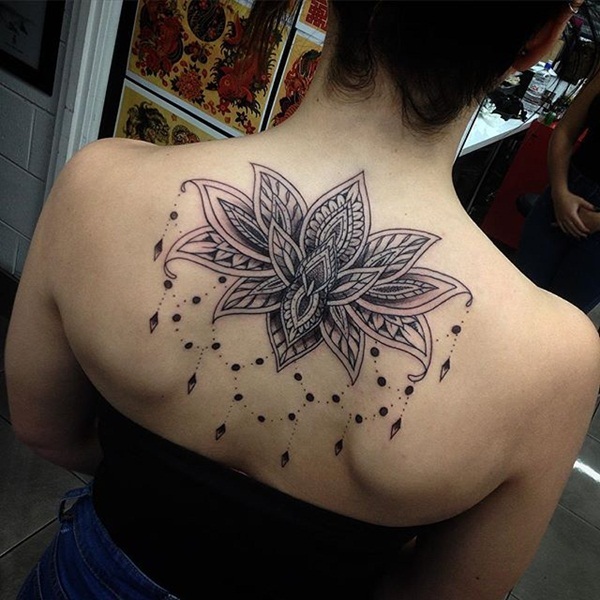 The exterior petals and inner shading of this back tattoo are created through dotwork style. 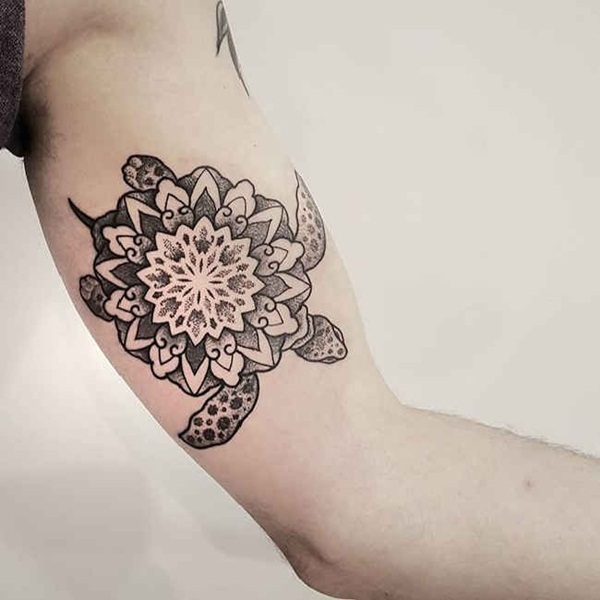 For complex designs like mandala tattoos, the dotwork technique is always a great choice to make the designs stand out. 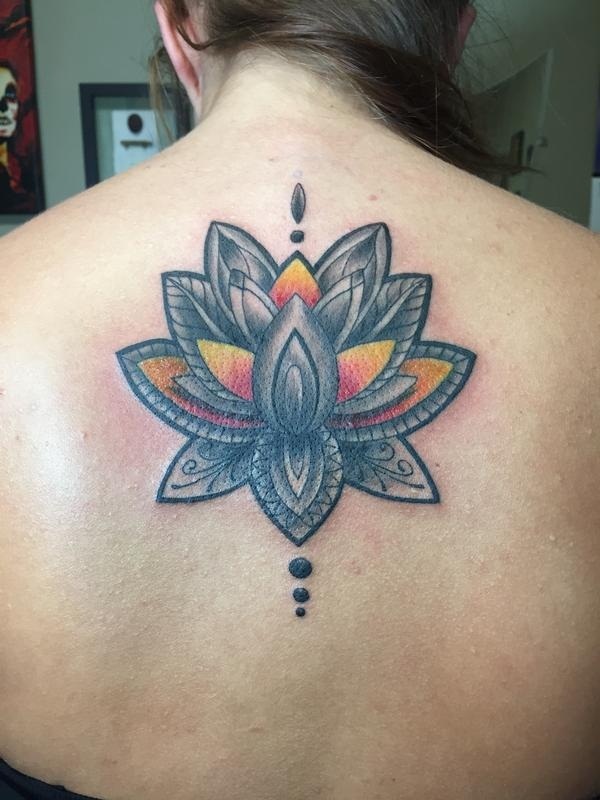 This attention-grabbing lotus mandala tattoo easily captures attention with its dark color and rich bold shading. 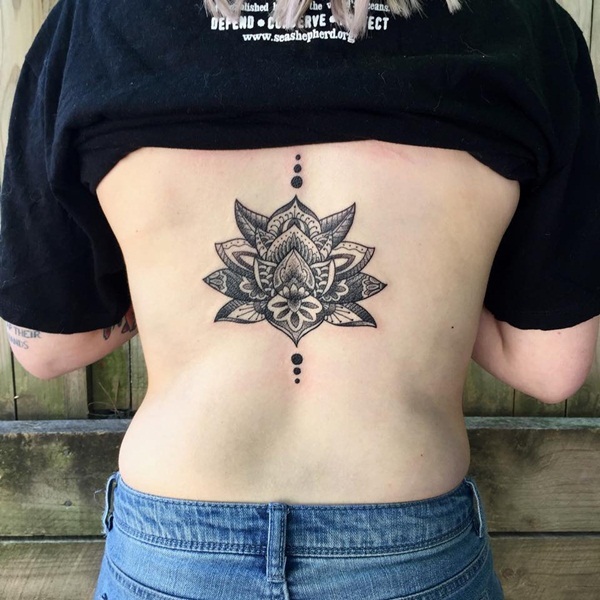 Just like other floral mandala tattoos shown above, this back tattoo exhibits great details and give off a sense of balance and calmness. Featuring fully shaded interiors with contrasting white and black edges, this wrist tattoo looks like a permanent wrist accessory that embellishes the hand. 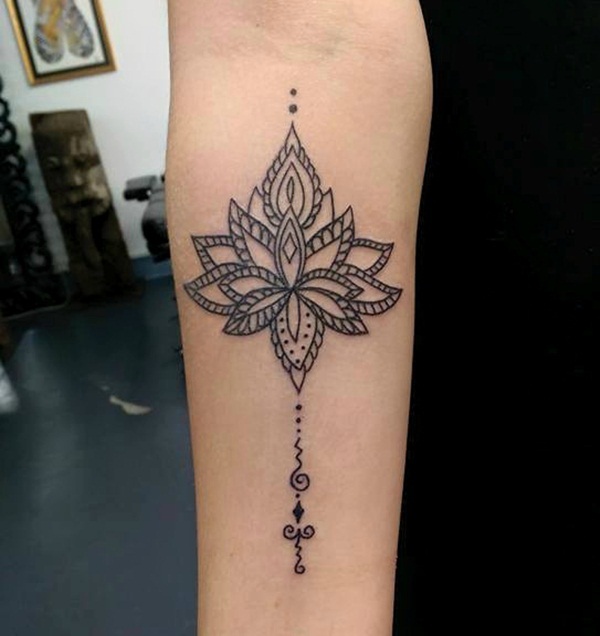 To give a little twist to the traditional lotus mandala design, this arm tattoo adds circular shapes which appear to depict the moon. Two of the shapes portray the quarter moon, while the rest show either half or full moons with nice shading to create shadows. 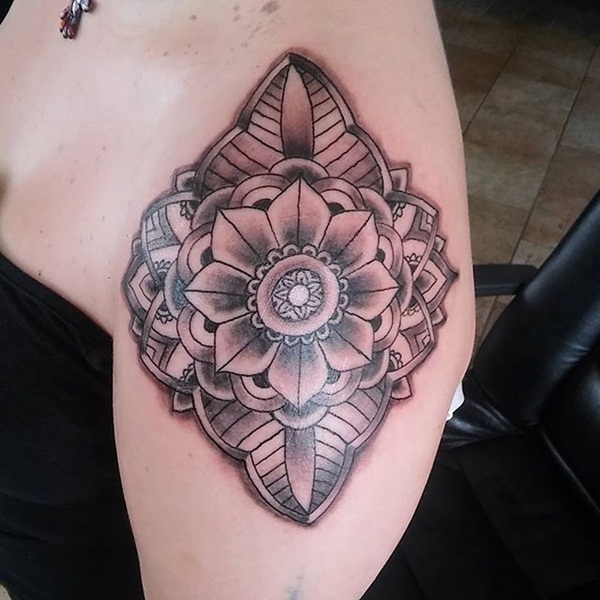 A lovely black and gray lotus mandala tattoo with proportional shapes on all sides. 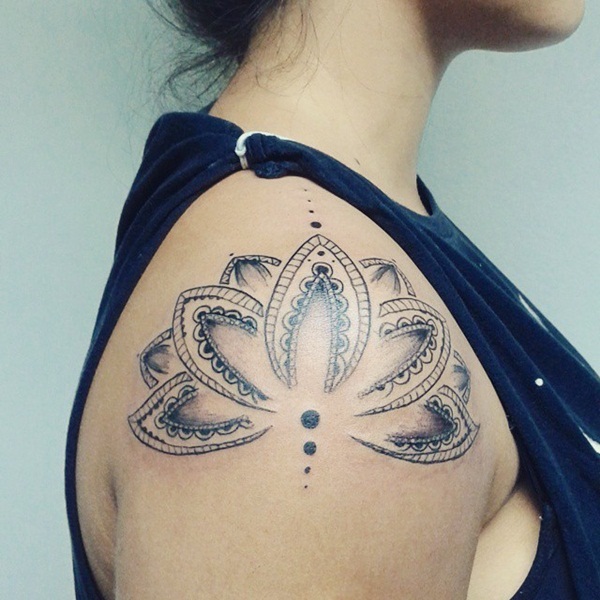 This mandala tattoo depicts a softer, more fluid version of the lotus and infuses light shading. 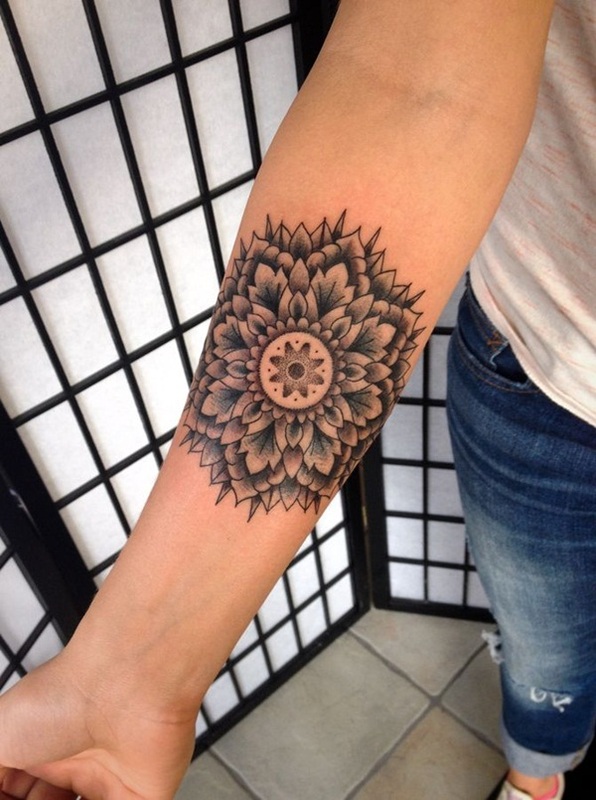 Showing off hints of dotwork style, this lotus mandala tattoo instantly beautifies the arm. 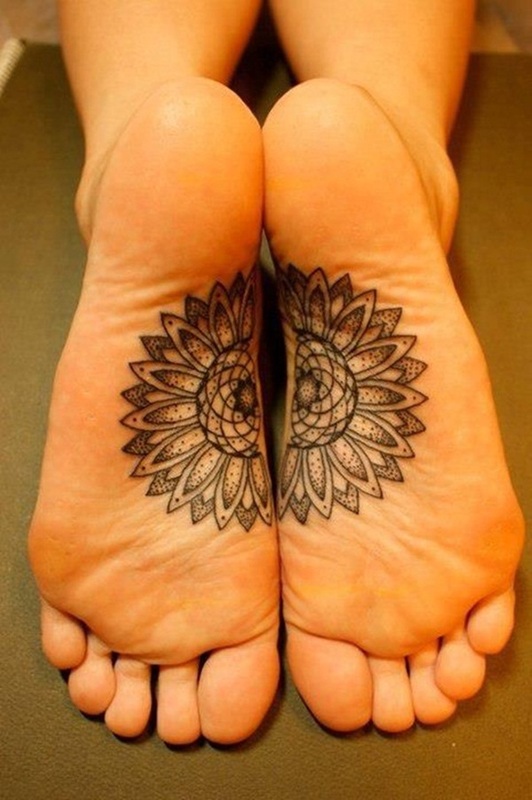 Mandala tattoos don’t always have to be meticulously detailed. 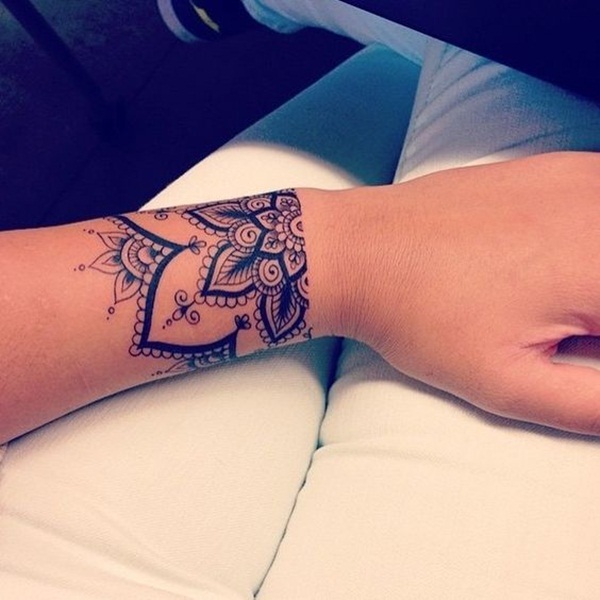 This wrist tattoo looks clean, simple, and pleasing to the eye. 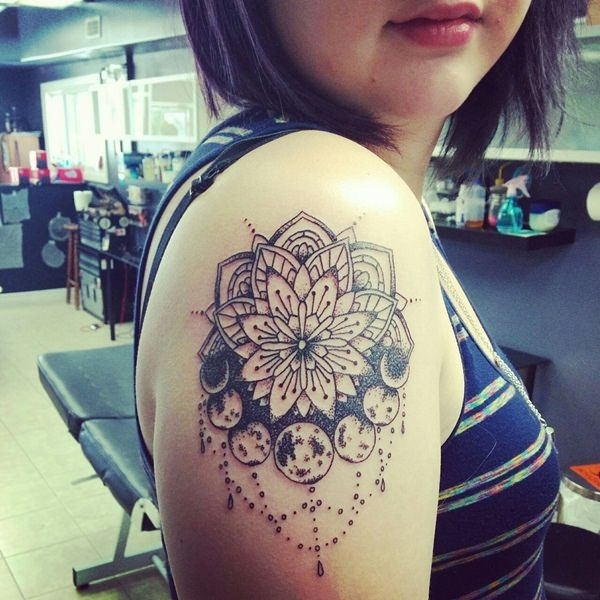 The lotus bloom in this mandala tattoo looks quite charming and appears as if it’s blossoming out of the arm. Another simple tattoo that looks clean, uncluttered, and well-proportioned. 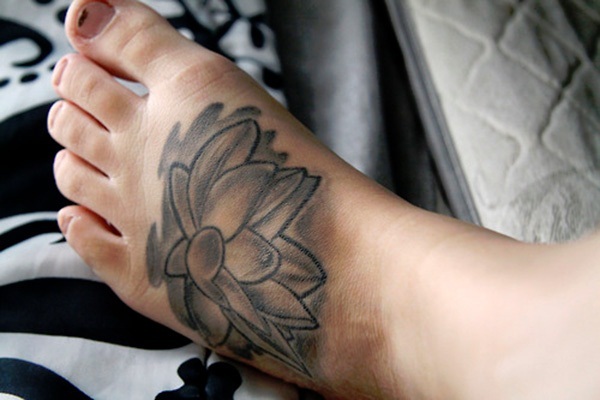 This lotus mandala tattoo is perfect for a woman’s foot, as it represents grace, beauty, and life. Nothing out of the ordinary, but this tattoo immediately draws the eye. Buddhists are known to use the lotus flower as a symbolic representation of achieving peace and transcending into enlightenment. 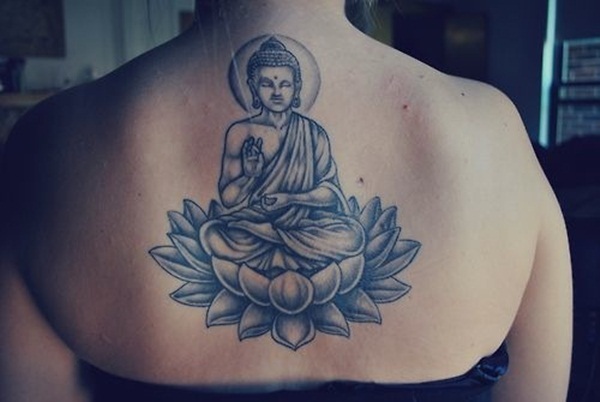 This tattoo is quite meaningful, as it depicts Buddha sitting on a blossoming lotus. If you believe in achieving spirituality through meditation or you simply appreciate the ways of Buddha, this tattoo is an excellent way to express your beliefs. As explained earlier, the lotus of a symbolic flower that’s commonly used in Buddhism and other religions. Buddha himself used the lotus to explain how the filth of the world cannot stain our souls. 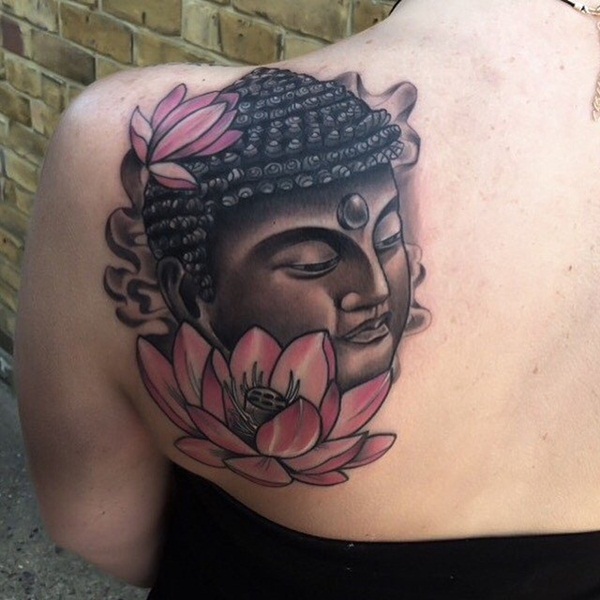 This tattoo prominently exhibits the face of Buddha surrounded by lotus blooms. A small arm tattoo characterized by dark shading. This back tattoo looks quite fresh and appears to still heal due to the reddish marks around. 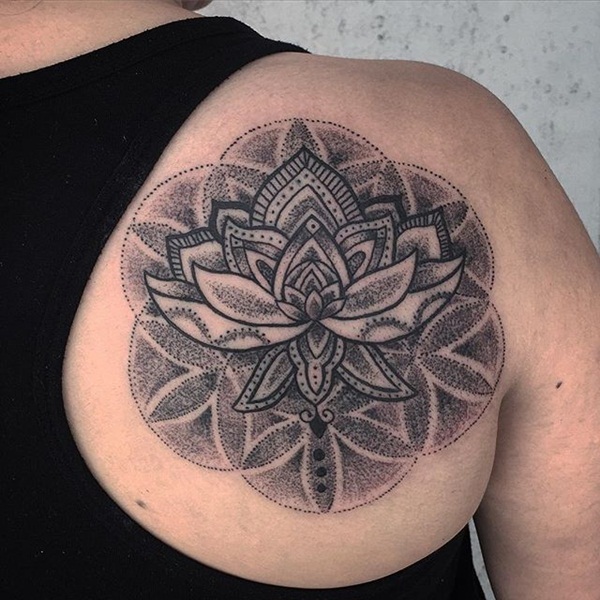 Combining dotwork and blackwork styles, this lotus mandala tattoo gives off a traditional vibe. What’s great about inking on areas such as the back is that you always have the option to conceal them or show them off depending on your choice of clothes. Back tattoos are perfect to reveal during summer months, especially when you frolic in the beach. Dotwork designs are always painstaking, as they require careful attention and hours of patience. 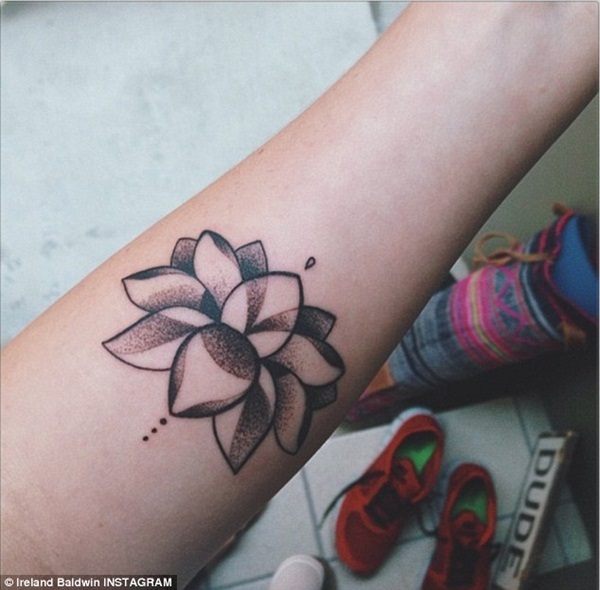 While this is not actually a 3-D tattoo, the shape of the lotus bloom looks rather realistic. 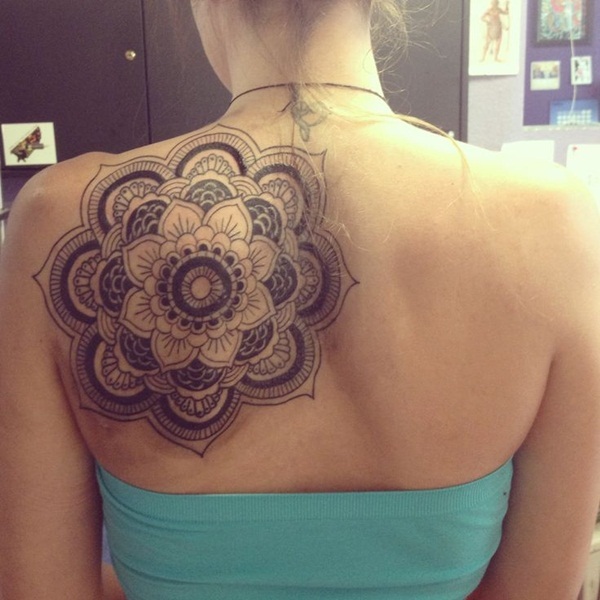 It seems that many women prefer to ink the nape of their necks or their back when choosing mandala tattoos. 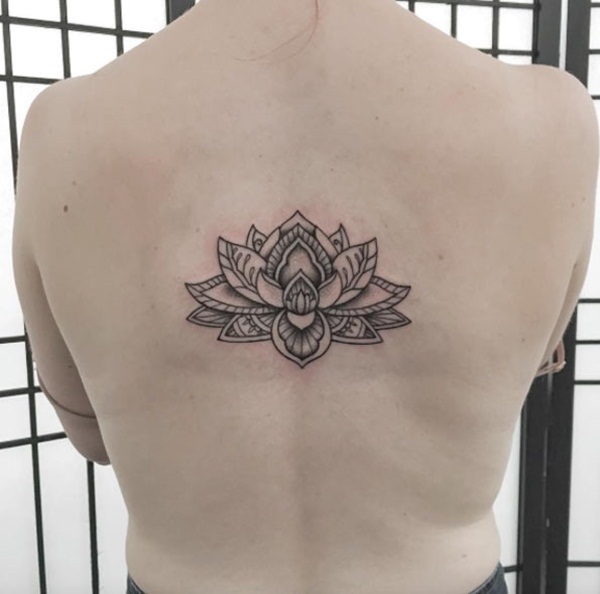 The unique placement of this dotwork lotus mandala tattoo portrays your fun, creative personality. One half of the design is uniquely placed on the sole of each foot, so that they connect and make a whole when you position your feet side by side. 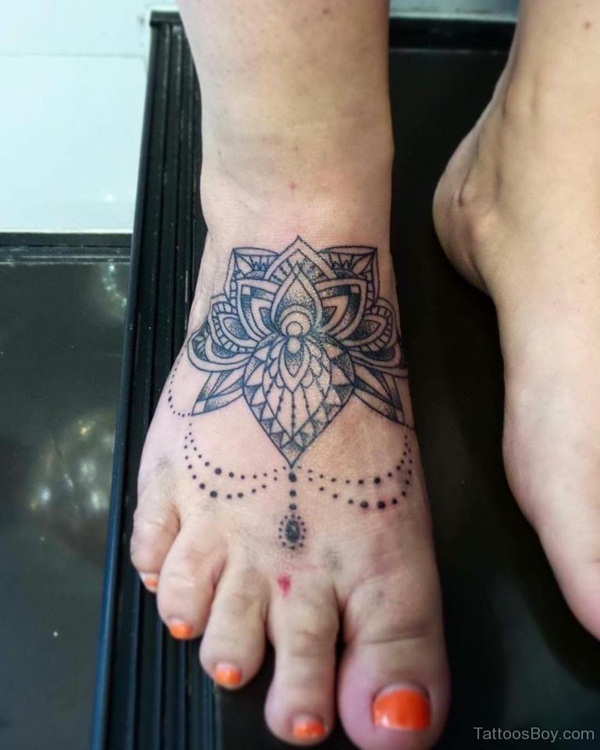 Another foot tattoo that embellishes the foot with its symmetrical pattern and dot accents. 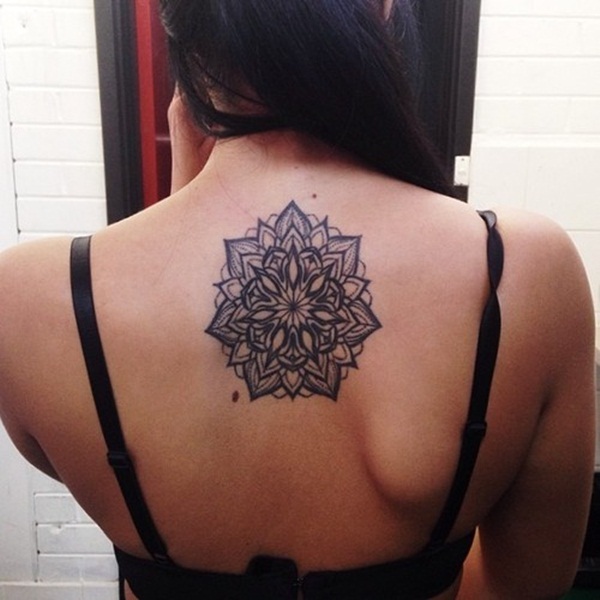 Mandala tattoos are inherently symmetrical. The shapes, whether organic or not, and the lines create a nice balanced look. 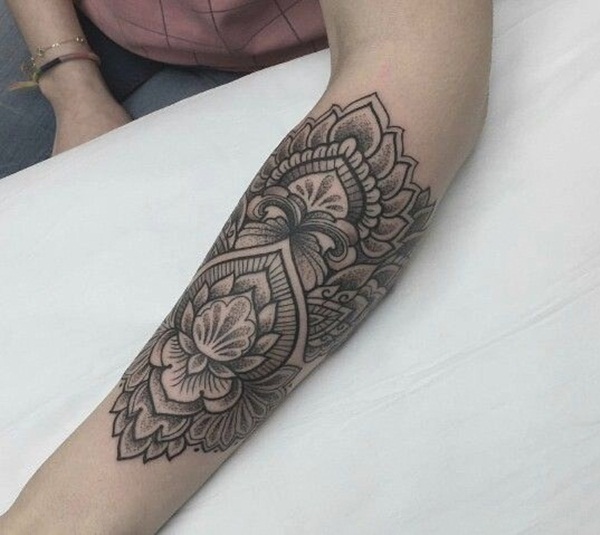 This arm tattoo looks a bit like a tribal design. 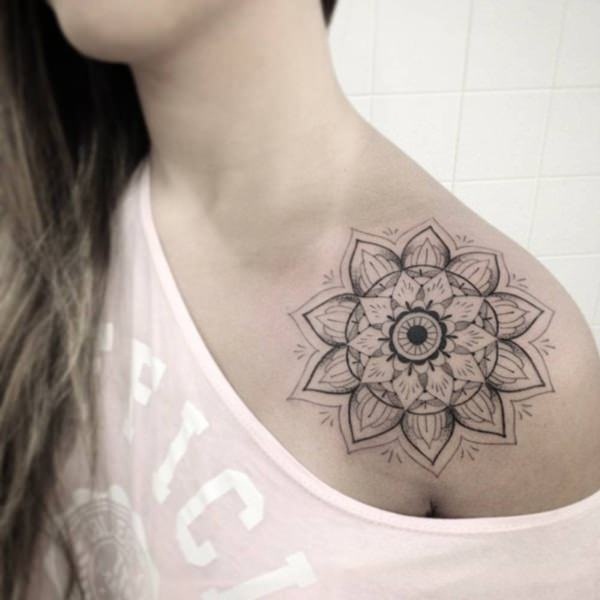 Located at the back near the shoulder, this tattoo exhibits clean lines without much shading for a simple look. Orange hues injects a jolt of color to the black shading of this back tattoo. If you want to enliven and add a hint of playfulness to your tattoo design, it’s always a good idea to blend in one or more vibrant colors. Organic shapes make this floral tattoo look less rigid and more delicate. 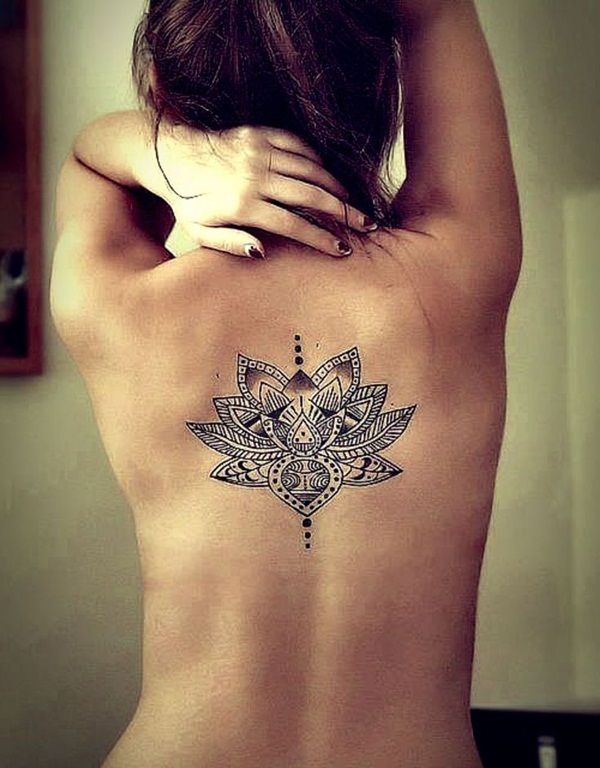 Like most lotus mandala tattoos, this back tattoo a proportional number of petals on both sides for a balanced look. 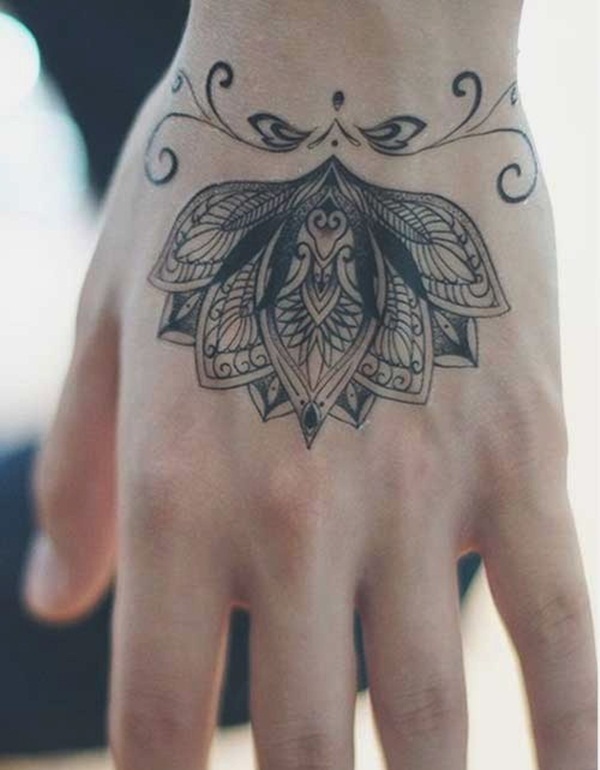 The delicate lotus bloom is a perfect choice to adorn the hand. 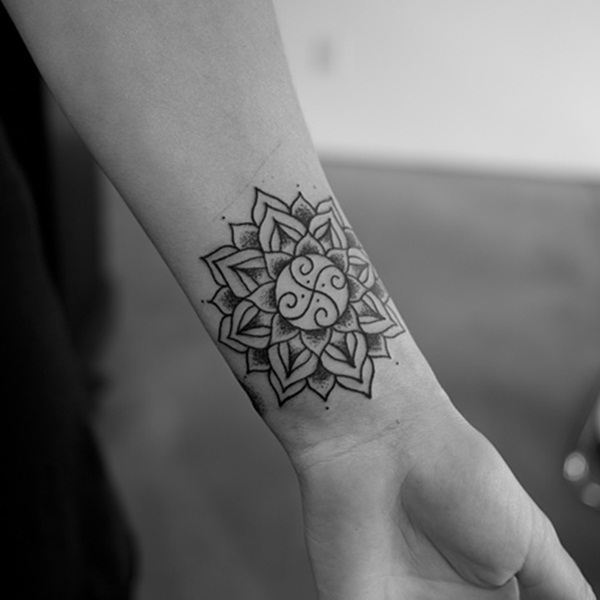 A mandala tattoo evokes a sense of tranquility and brings a soothing sensation when stared at for a long time. 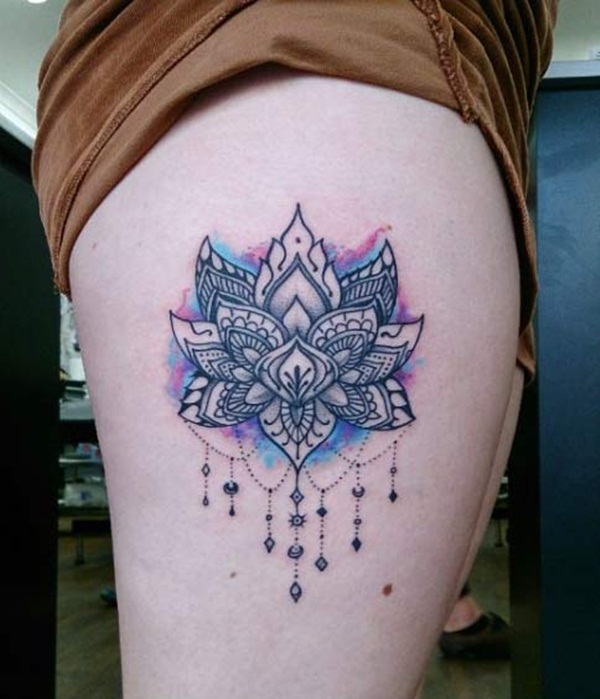 Featuring vivid colors and shimmering hues, this thigh tattoo definitely catches the eye and impresses onlookers. 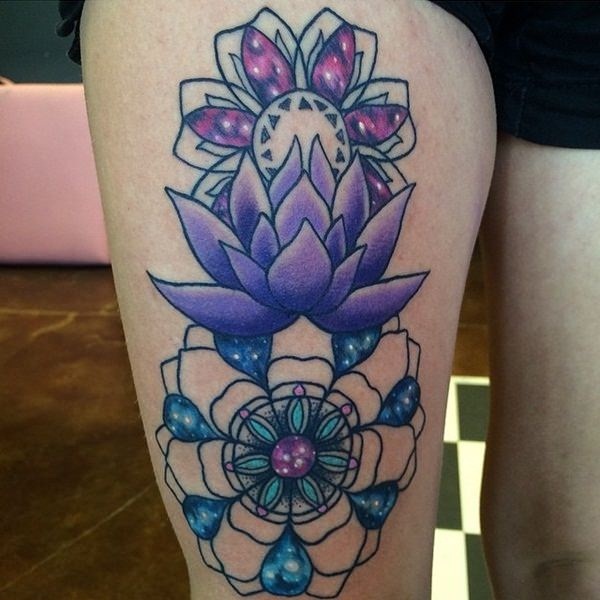 The purple color palette and hints of sparkle bring life and vitality to this unique thigh tattoo. 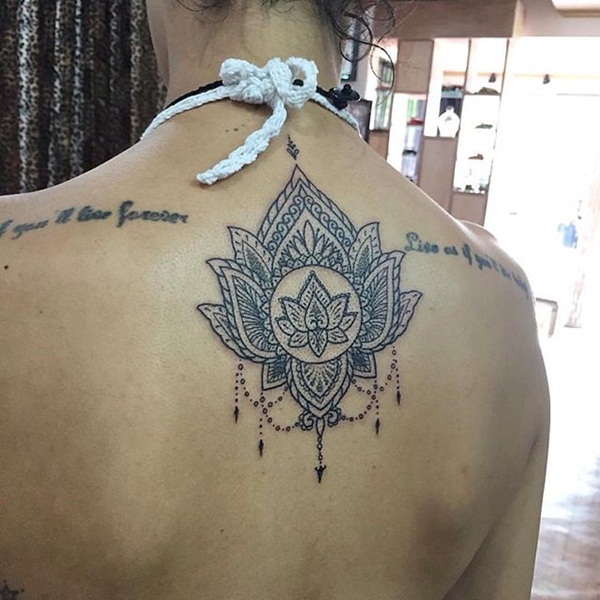 This lotus mandala tattoo lies just below the chest, giving the person the option to show it off by wearing cropped tops or to keep it hidden with shirts. Petal-adorned lines are traced just below the breasts for a hint of playfulness and creativity. Yin yang is a popular symbol that represents the balance between good and bad in the Chinese culture. 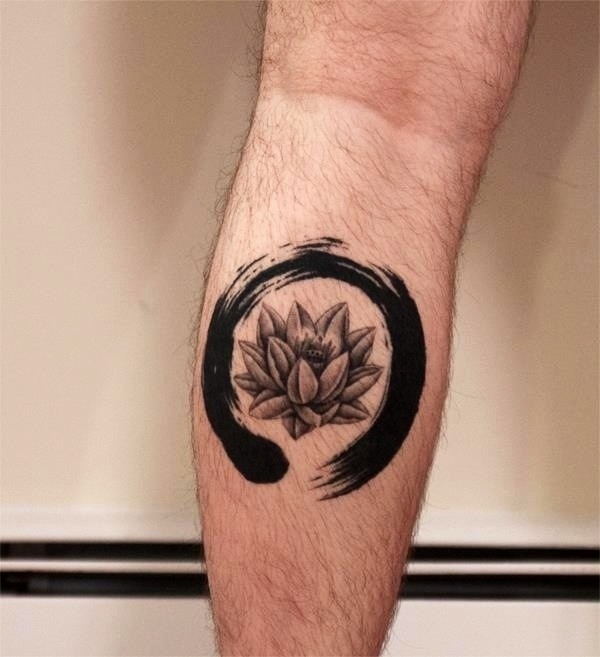 This tattoo holds more meaning because of the addition of the Yin Yang symbol to the middle of the lotus mandala design. 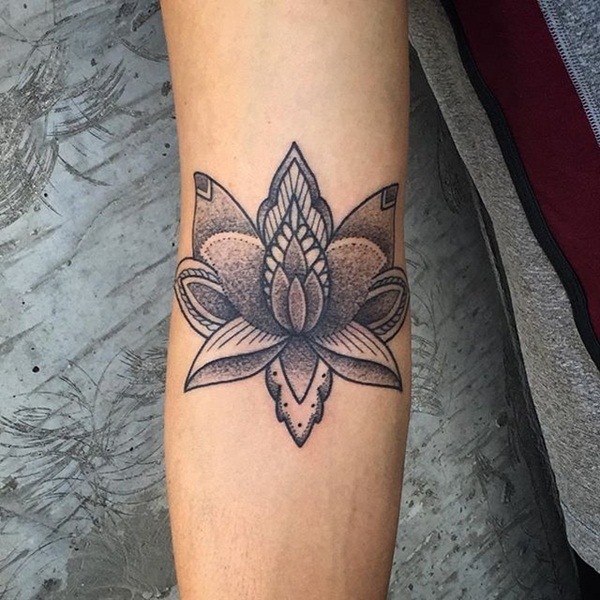 A dotwork tattoo that shows off a typical portrayal of the lotus mandala pattern. Dark shading characterizes this arm tattoo. 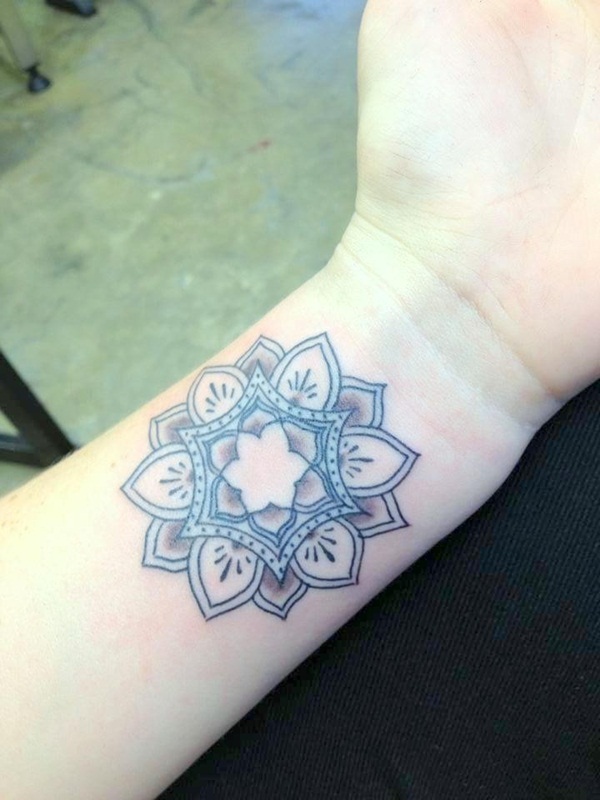 A simple mandala tattoo that looks inconspicuous yet charming. 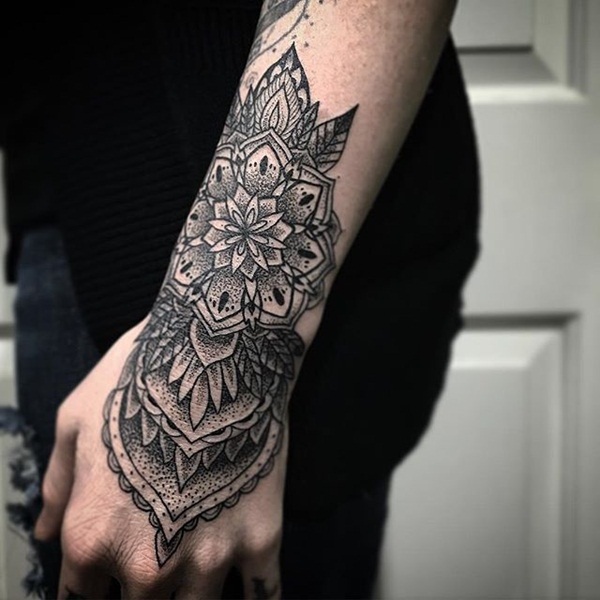 Intricate details are clear to see on this black and gray tattoo. 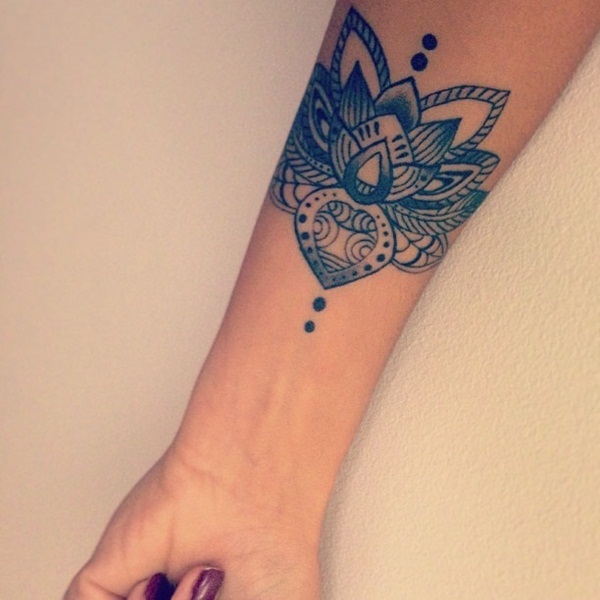 A faint outline adds emphasis to bolder inner outlines, and a hint of dotwork enhances the beauty of this tattoo. 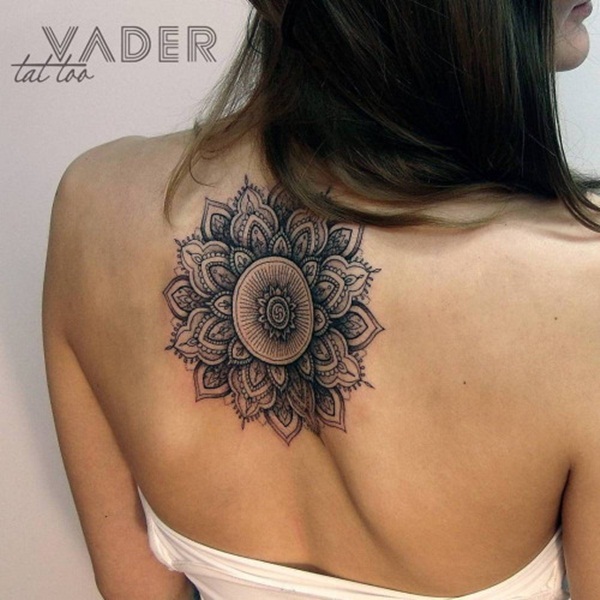 Many lotus mandala tattoos have small circular details, as if the flower has just emerged and delicately bloomed on a pond. Eight-petal lotus flowers lie atop each other, adding depth and creating an amazing layered look that immediately grabs attention. The outermost lotus has finer petal details for a more complex design. 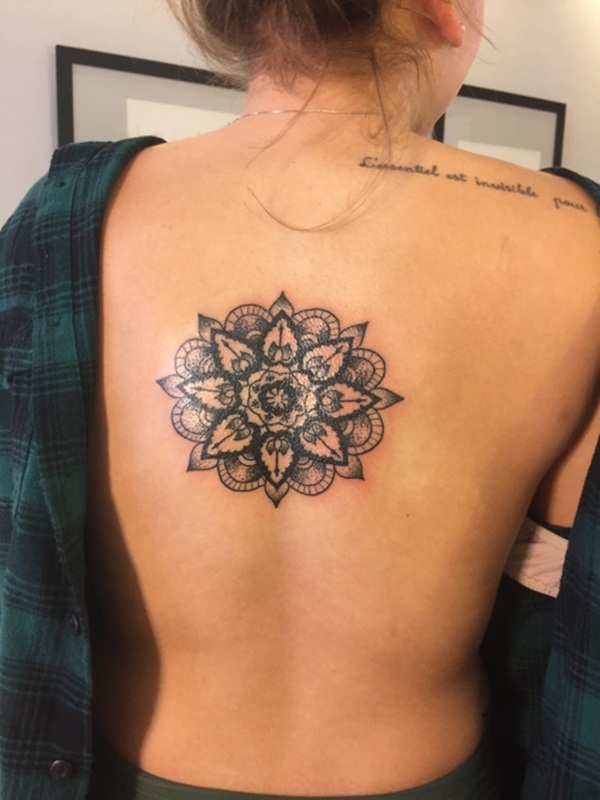 Besides the common eight-petal lotus mandala, many people believe that seven petals serve as a sacred number for this type of tattoo. 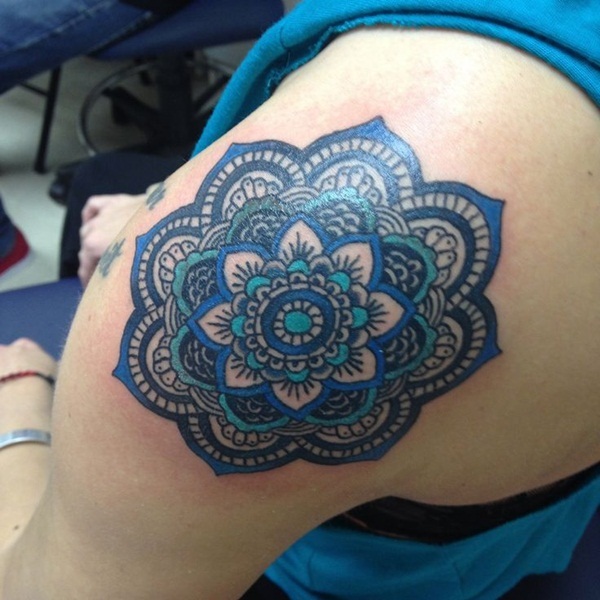 The blue-shaded floral centerpiece adds color and breathes life into this well-balanced shoulder lotus mandala tattoo. 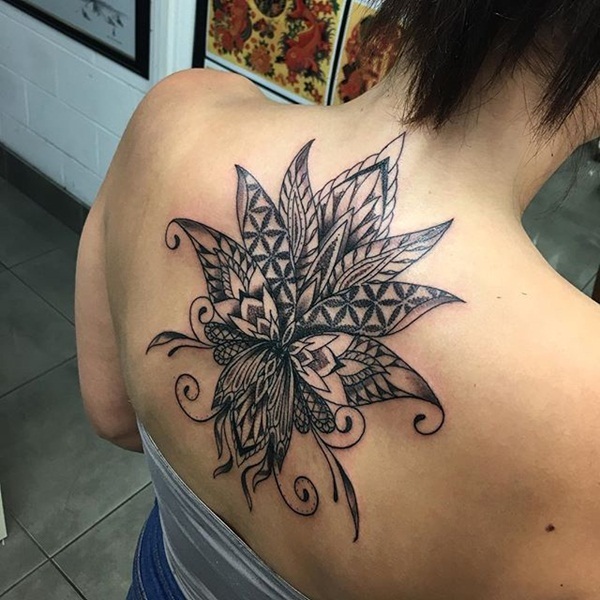 Inked on half of the upper back, this floral tattoo instantly draws the eye. 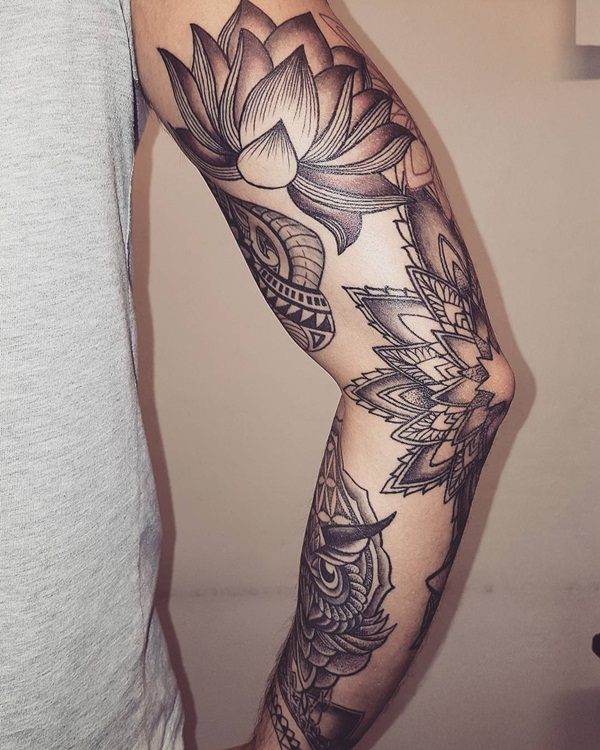 Thick black outlines, thinner outlines, and dark shading blend well together to create a meticulously crafted tattoo that doesn’t skimp on details. 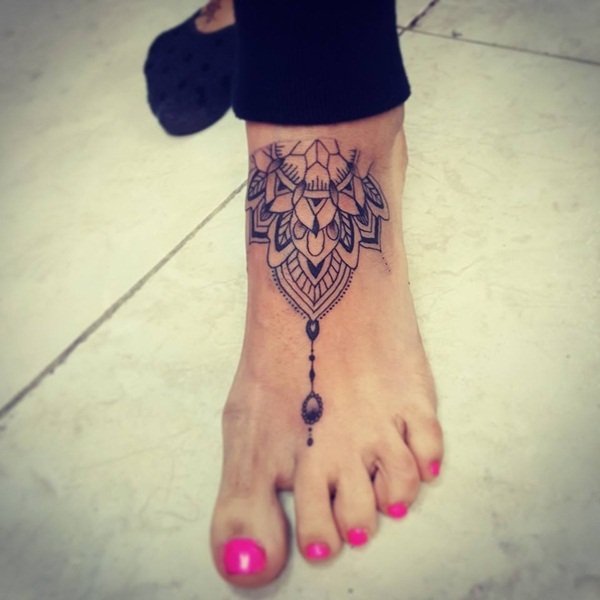 A dangling accent points to the middle toe, and only half of the mandala adorns the foot like a beautiful accessory. 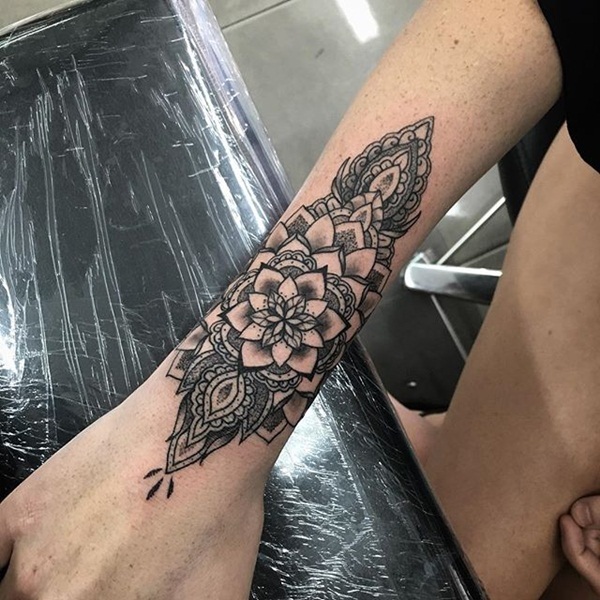 Compared to other more complex mandala tattoos on this list, the wrist tattoo above looks rather more simplistic and features nice dotwork shading to add a faint silhouette to the floral design. Like the lotus flower, turtles are peaceful animals that represent serenity. 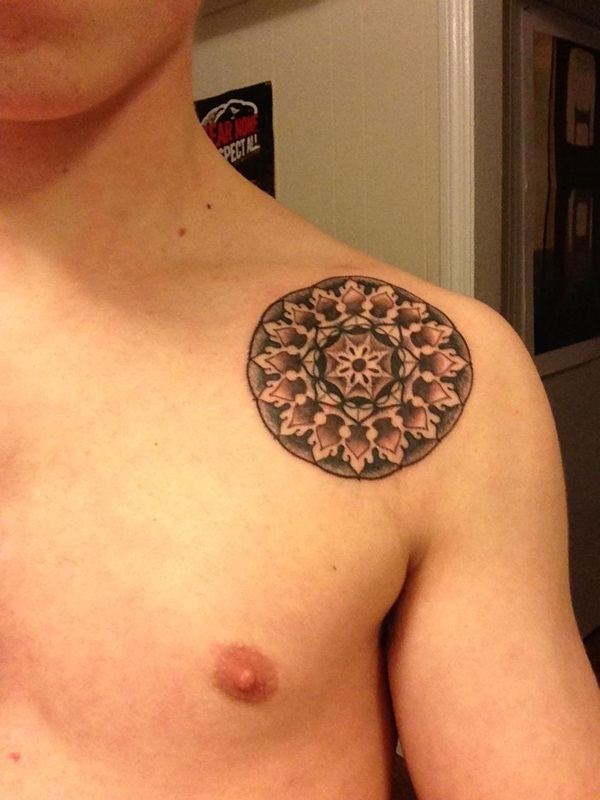 This tattoo artistically transforms the shell of a turtle into a lotus mandala. Dark spots on the turtle’s body blend well with the floral design. 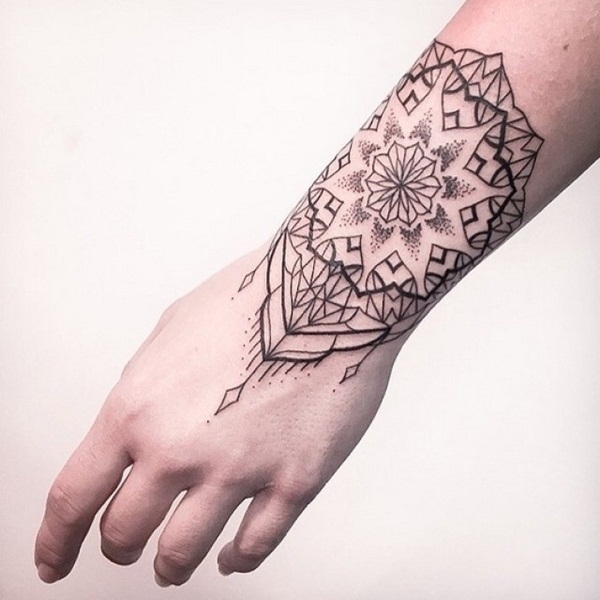 This tattoo makes use of more rigid edges and geometric shapes to create a symmetrical design that accessorizes the arm down the hand. The shape and appearance of leaves are more noticeable on this tattoo, which features organic shapes and fluid outlines. There’s no bold shading or thick dark lines, but this simple arm tattoo is still worth noting. A thick black stroke encircles the near-realistic lotus bloom. 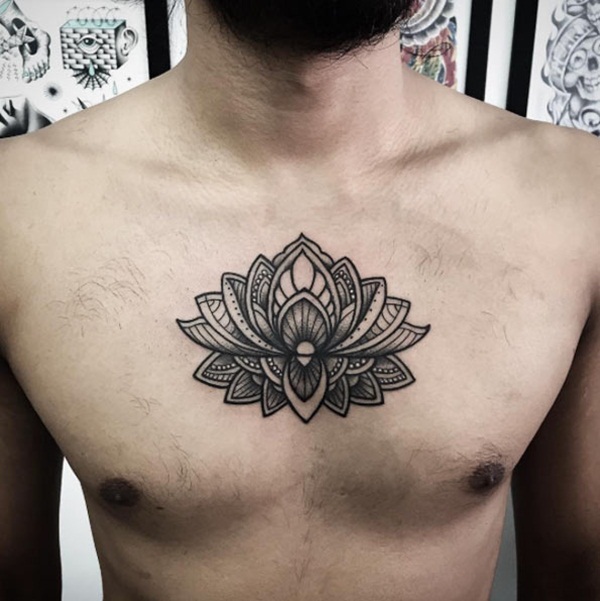 Light and dark shading combine to bring depth and texture to this lotus mandala upper chest tattoo. 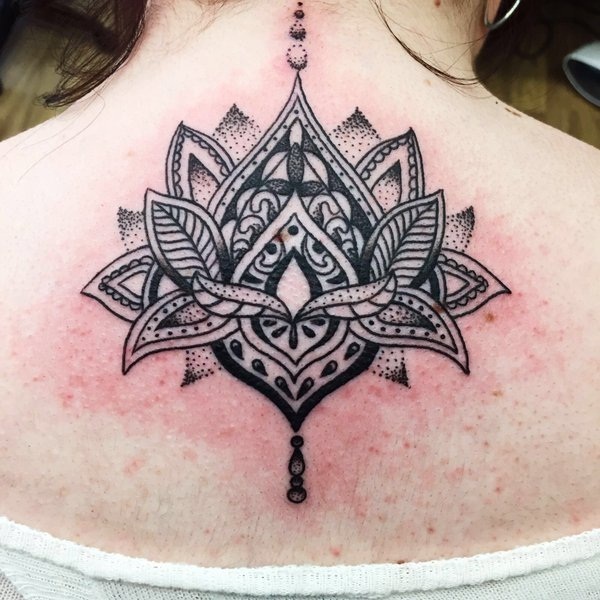 Dotwork style is a perfect technique to add excellent silhouettes to tattoos. 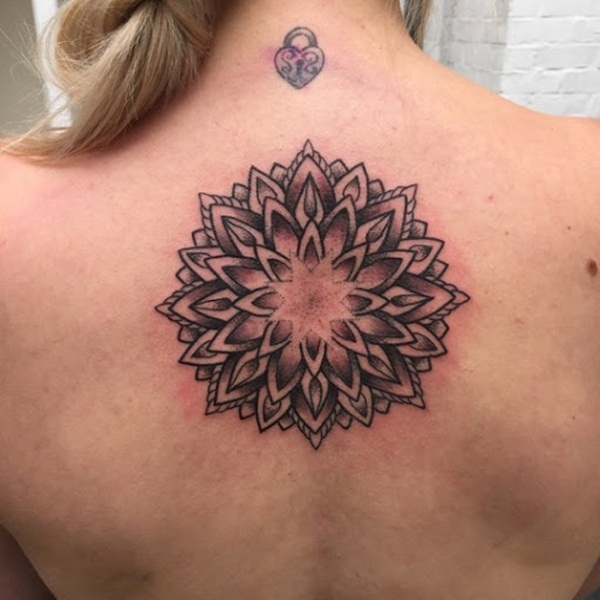 A smaller version of lotus mandala tattoos, this delicate floral artwork adds interest and enhances the look of your back. Small pointy shapes decorate the edges of each outer petal, while the heavily shaded outline highlights the lightly shaded inner flower. There’s a lot of things going on in this tattoo, and it’s clear to see the painstaking effort put into creating all the details. Compared to other black and gray tattoos, this artwork flaunts vibrant colors. Orange, green, and yellow hues enliven the tattoo. Dragonflies lie side by side inside the mandala tattoo, infusing a touch of nature to the design. 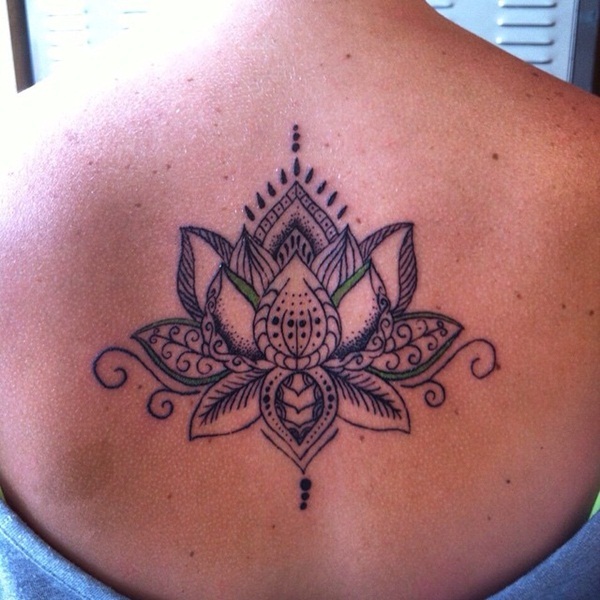 A hint of green color enhances the delicate beauty of this artistic lotus back tattoo. 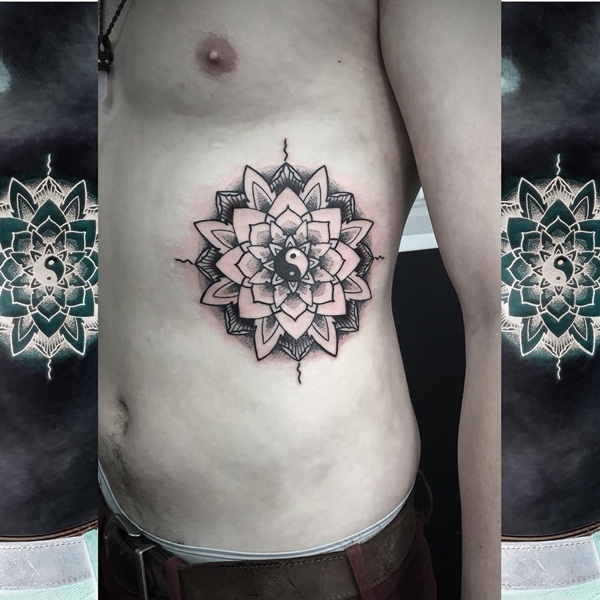 Longer than traditional mandala tattoos, this piece of art features a grid backdrop, which adds a bit of dimension to the overall design. Thin dangling accents hang from the lotus bloom and further embellish the simple exquisite design. 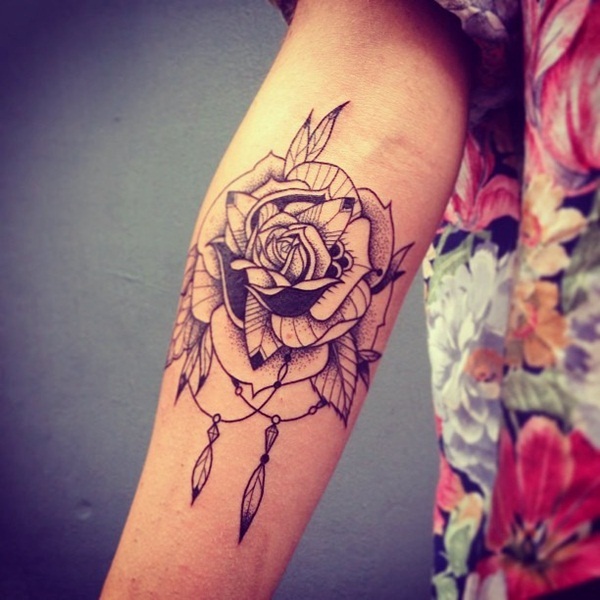 Small lines add detail to the petals of this floral tattoo. 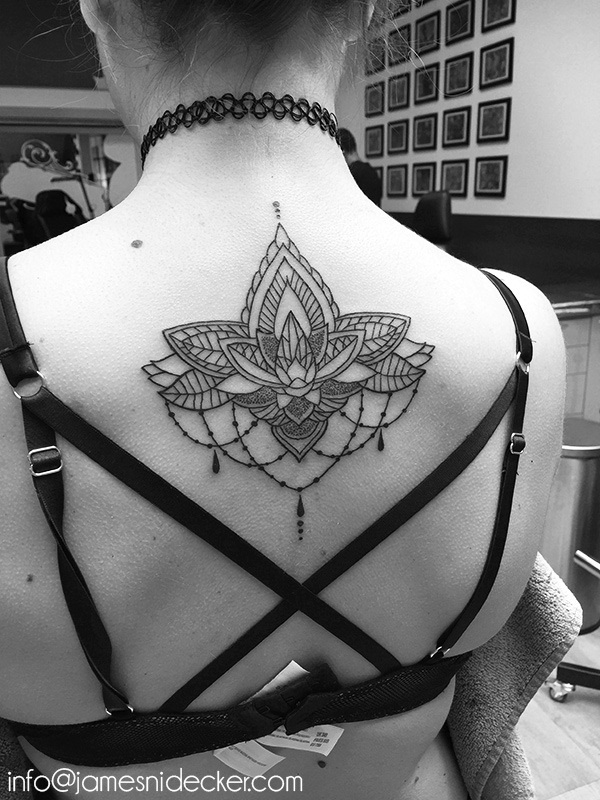 The right amount of shading creates lovely silhouettes on this lotus mandala shoulder tattoo. 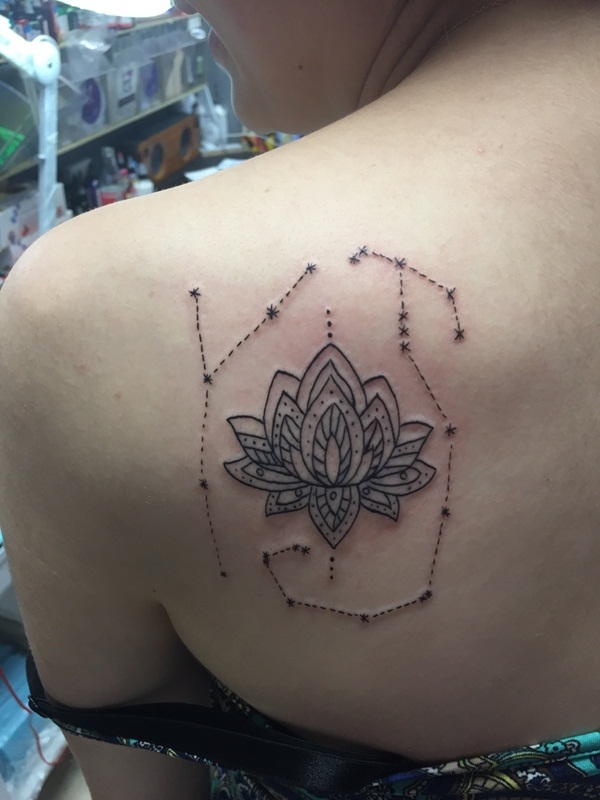 The array of small asterisk-shaped stars around the simplistic lotus tattoo adds deeper meaning. 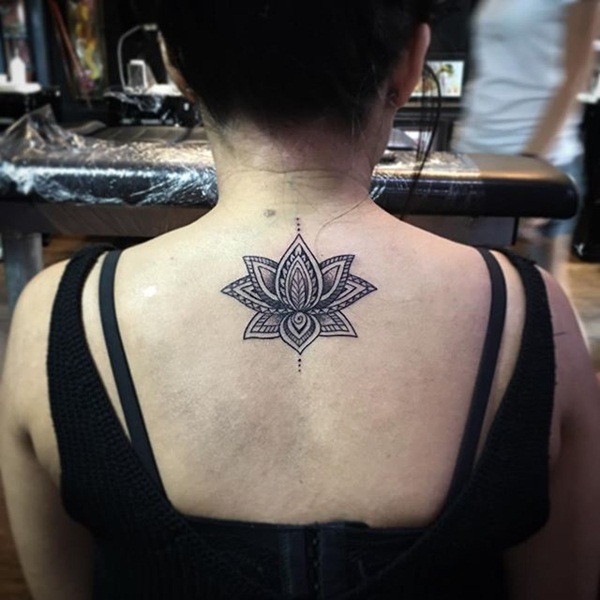 The sight of a lotus mandala tattoo evokes a sense of spirituality and inspires people to live a less materialistic lifestyle. 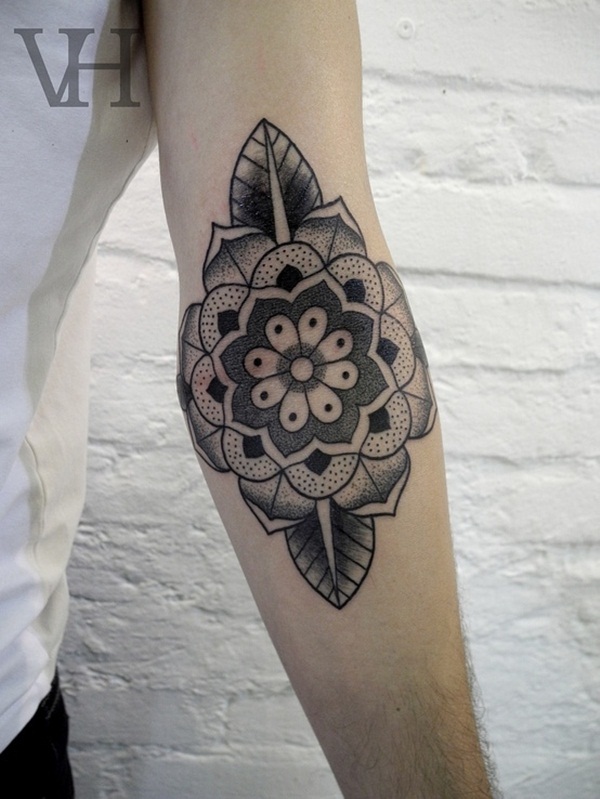 The layering of multiple petals adds depth and texture to this charming tattoo. 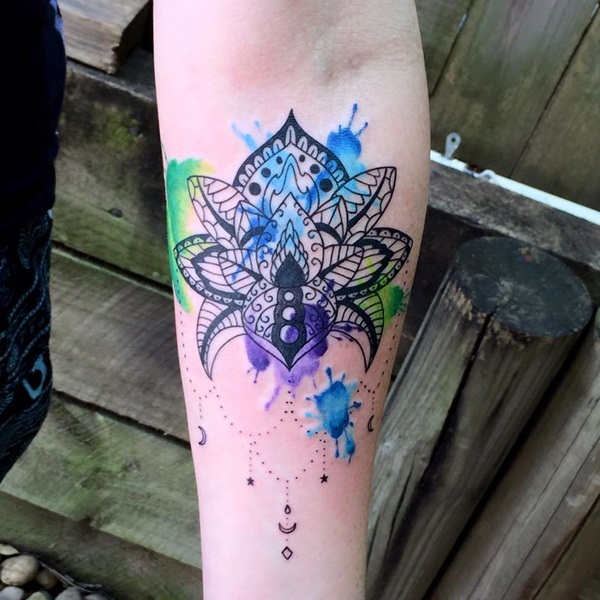 Blue, purple, green, and yellow watercolor splashes instantly liven up this bold lotus mandala arm tattoo. If you want to make your tattoo more interesting and eye pleasing, a bit of color will definitely transform it into an eye-catching artwork. There you have it! 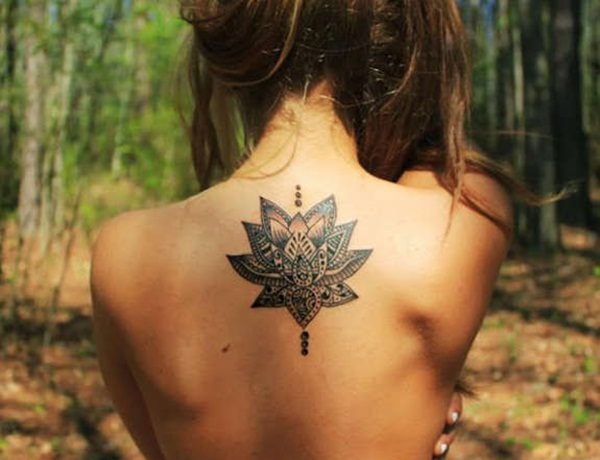 These lotus mandala tattoos look quite artistic, and some of the thought-provoking designs convey deep meanings. Whether you want to get inked for aesthetics or to express your beliefs, the tattoos above provide plenty of choices for you.